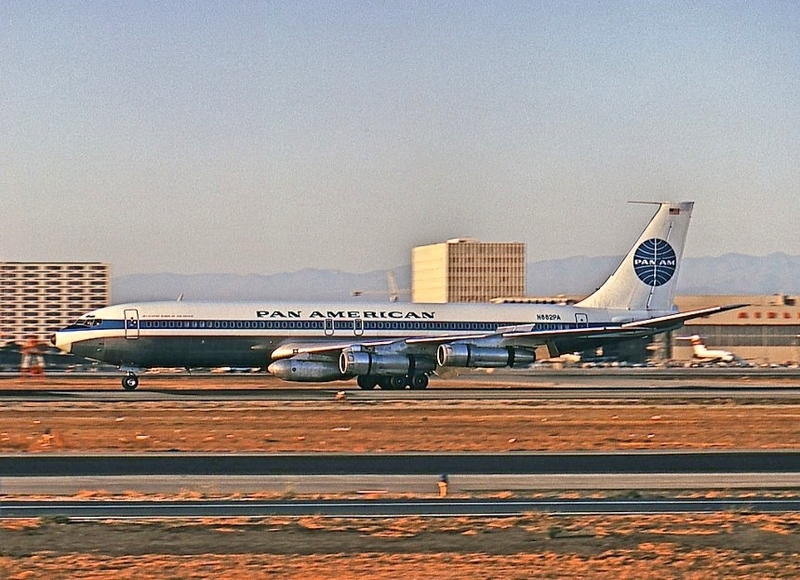 In the previous posting, the story of how Pan American World Airways began operations to the Soviet Union were detailed from the early negotiations to the first flight on 15 July 1968. 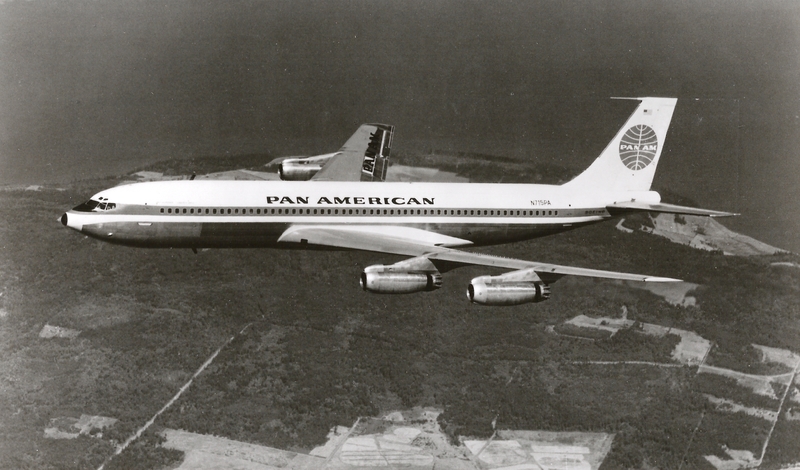 For the next ten years, Pan American operated at least a weekly flight between New York and Moscow using Boeing 707 equipment. 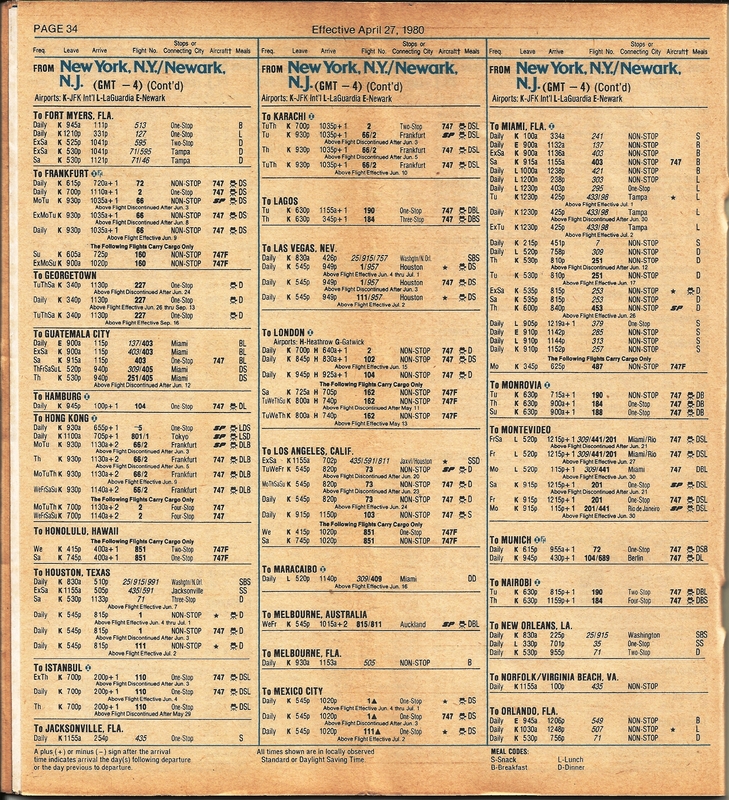 In 1978, the service was suspended largely due to commercial reasons. 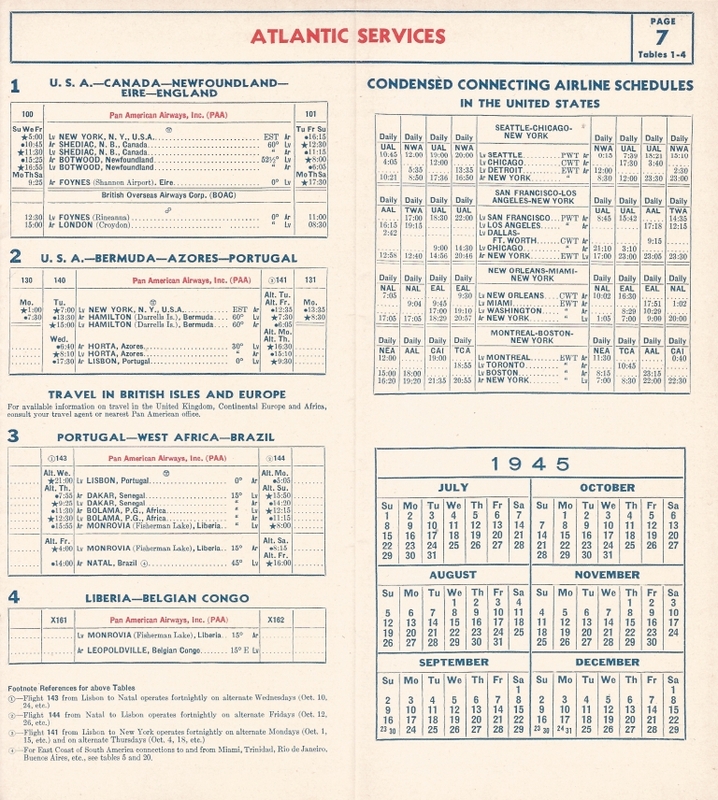 By October, 1971, the service was changed to flights 102 (eastbound) and 103 (westbound), with a stopover in London. 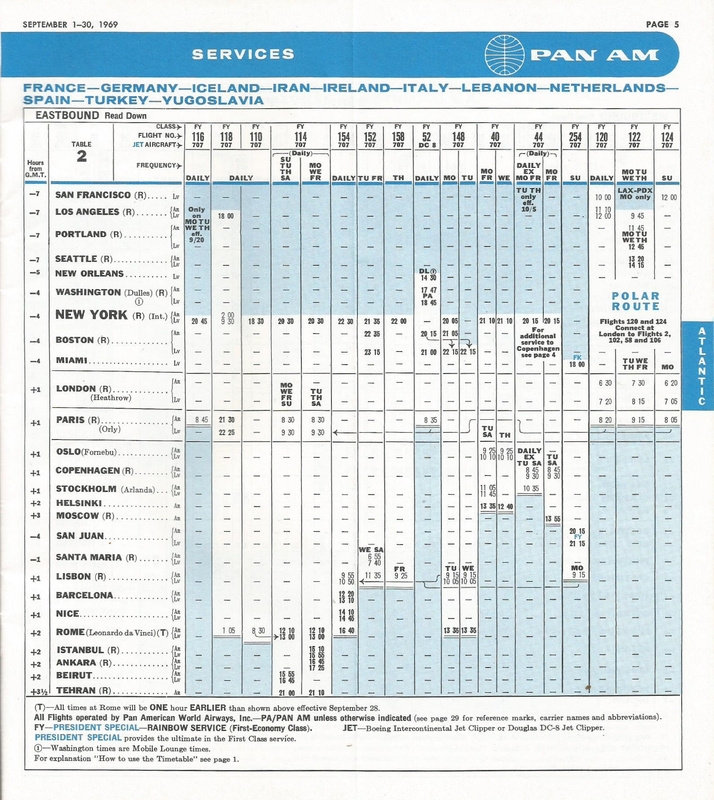 This was a once a week rotation, with the eastbound flight departing New York on Friday and the westbound from Moscow on Sunday. 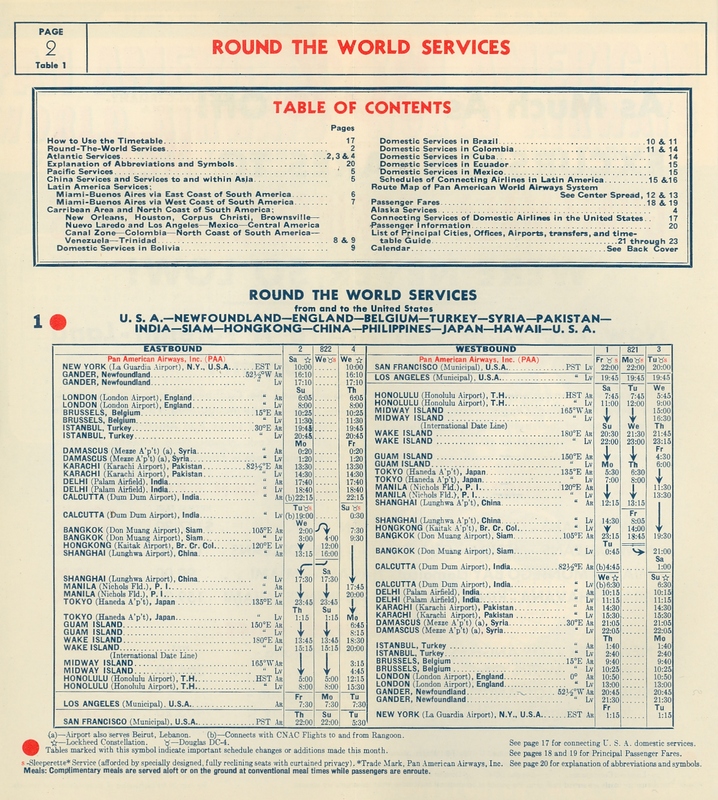 No local traffic was permitted between London and Moscow. 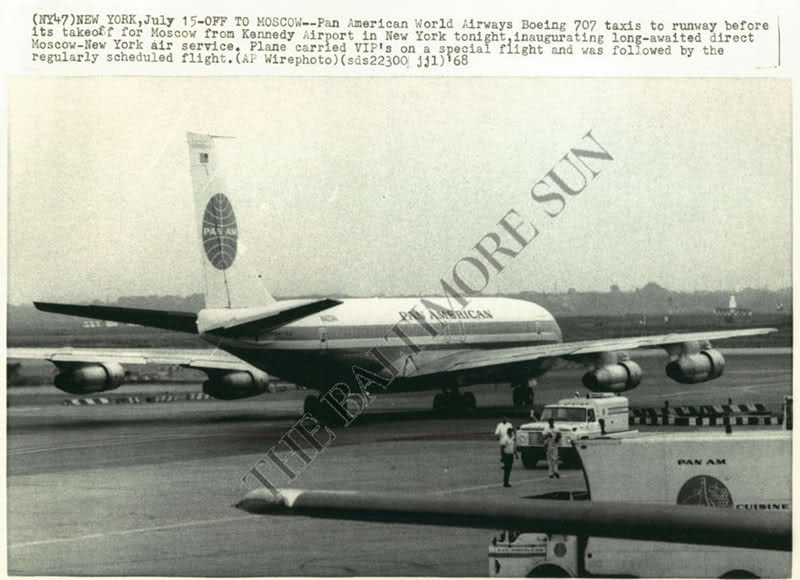 The flights were operated with Boeing 707 equipment. 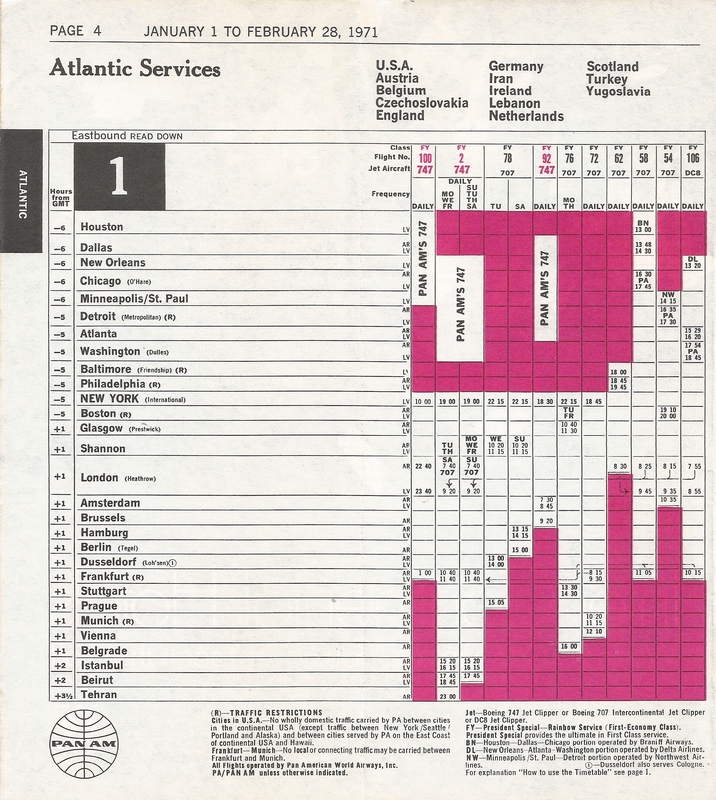 This service continued through October 1973, although the timetable did not indicate any restrictions on local traffic between London and Moscow. 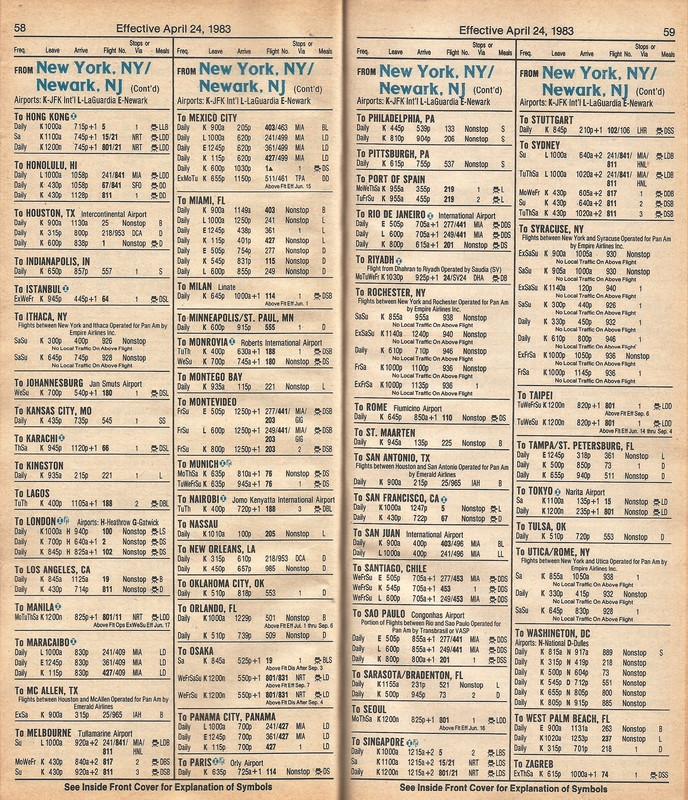 By 1975, the original flights 44/45 returned to the schedule, with a once weekly service between New York and Moscow, eastbound on Saturday and westbound on Sunday with Boeing 707 equipment. 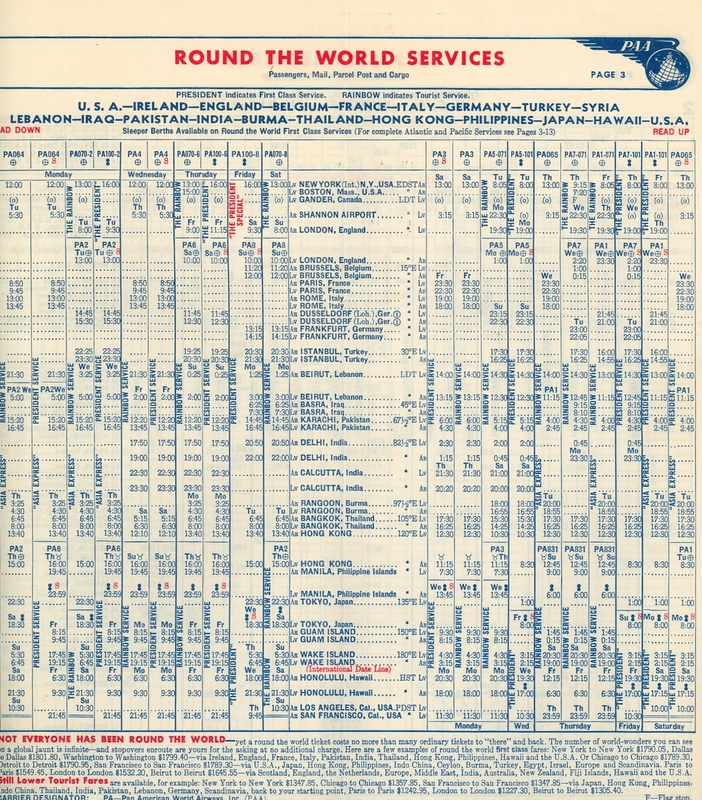 The stopover in Copenhagen was re-instated and there was no indication that there were restrictions on local traffic in the December 1975 timetable. 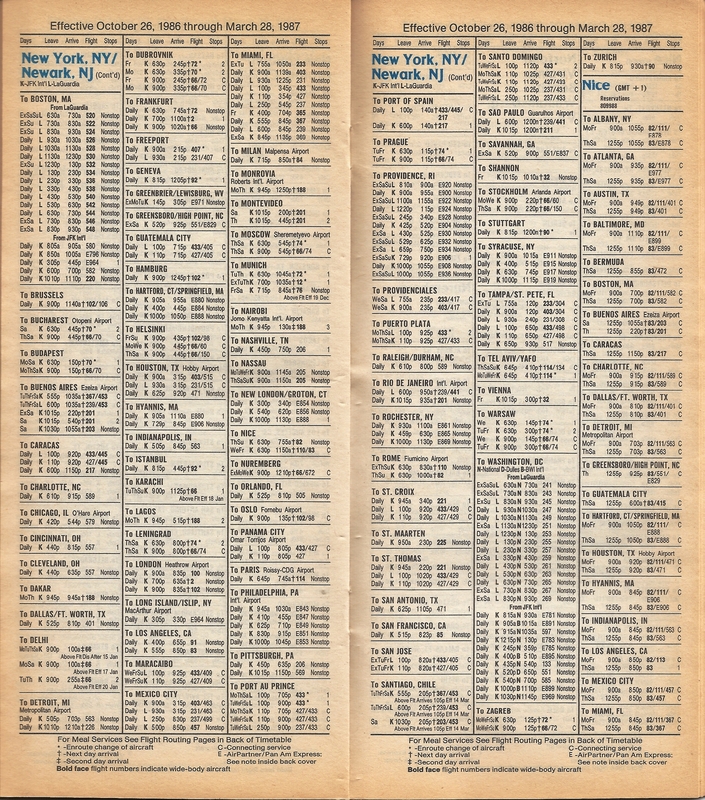 Flights 44/45 also made a New York-Copenhagen-Warsaw rotation on Sundays and Thursdays, returning on Mondays and Fridays with Boeing 707 equipment. 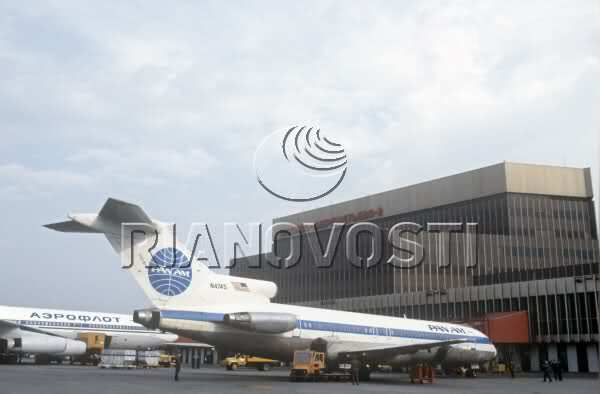 By August 1978, the last year of operations between New York and Moscow, the service was operated by flight 66 eastbound and flight 67 westbound, using Boeing 747 equipment between New York and Frankfurt and Boeing 727 equipment between Frankfurt and Moscow. 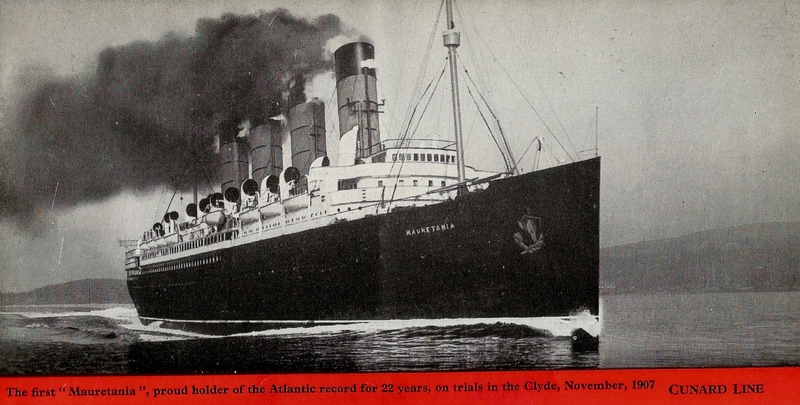 The rotation operated twice a week, Mondays and Fridays eastbound and Wednesdays and Sundays westbound. 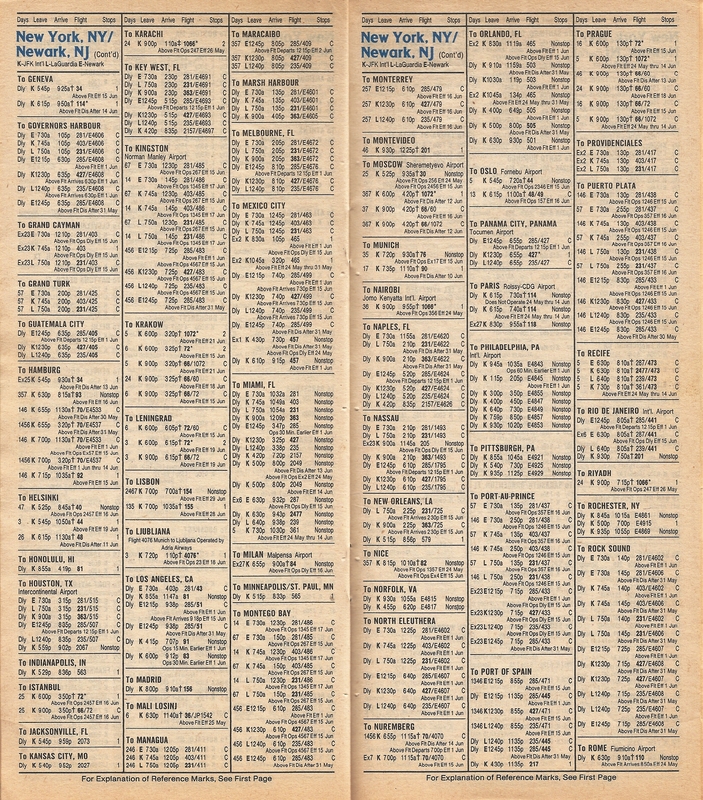 There appeared to be no restrictions on local traffic between Frankfurt and Moscow. During this ten year period, the US and the USSR. signed an agreement on joint cooperation in the field of transportation calling for exchanges of information in areas that included the safety and efficiency of civil aviation. 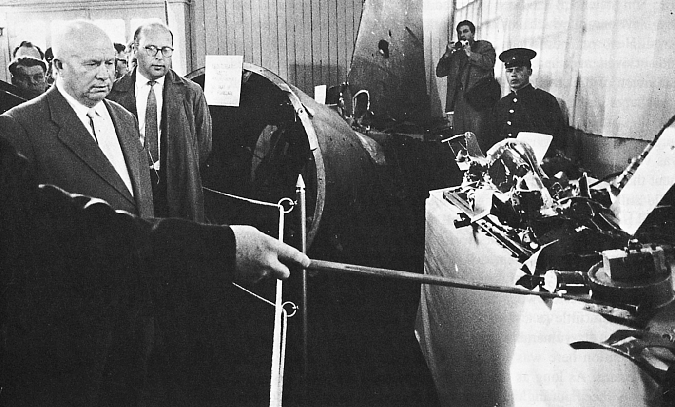 As a result of the pact, FAA officials and their Soviet counterparts held meetings on a variety of technical subjects. 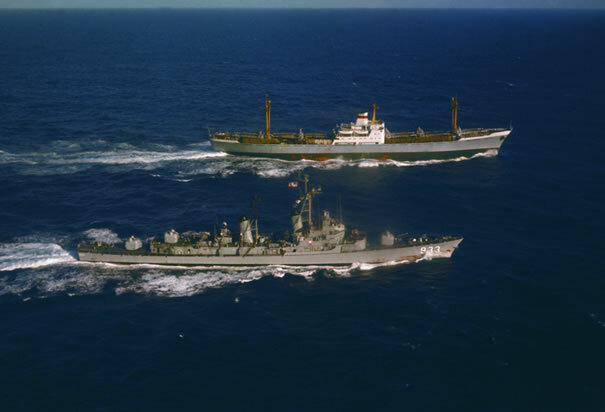 The agreement was one of a series signed by officials during a summit meeting between President Nixon and Soviet leader Leonid Brezhnev. 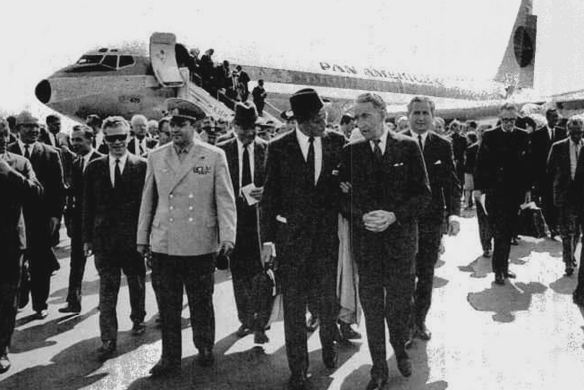 The last of these agreements, signed on 23 June 1973, provided for an expansion of direct airline flights between the two countries. 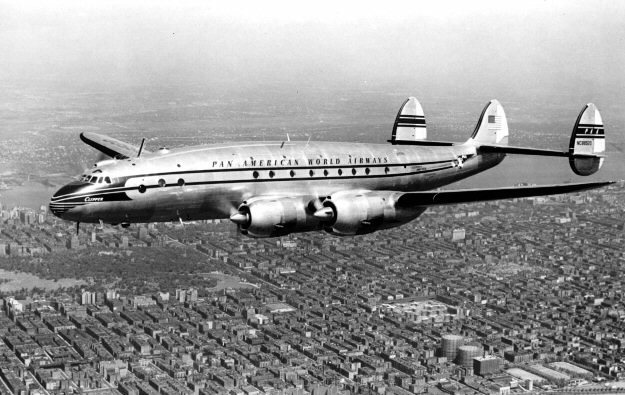 Previously, Pan American and Aeroflot had each been allowed two round-trip flights per week between New York and Moscow. 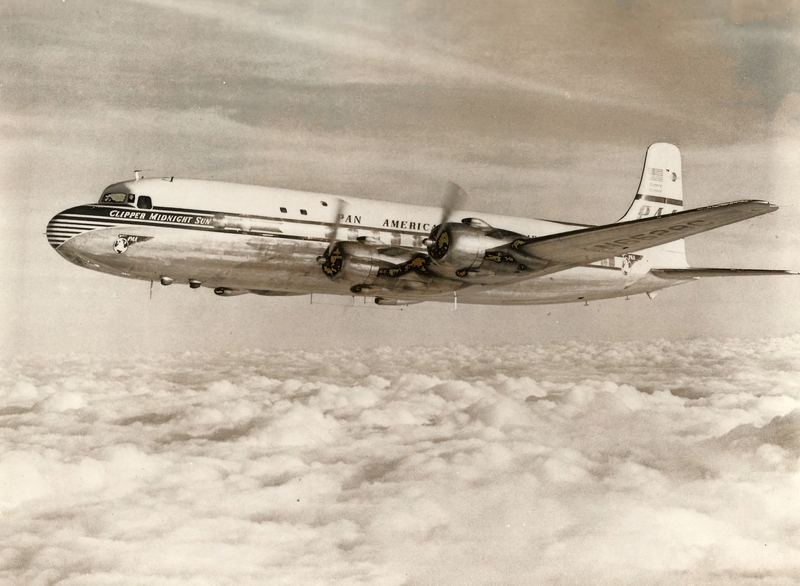 The two airlines were now permitted up to three flights per week, and Pan Am received authorization to land at Leningrad, and Aeroflot at Washington. The new authority was never inaugurated on a scheduled basis. 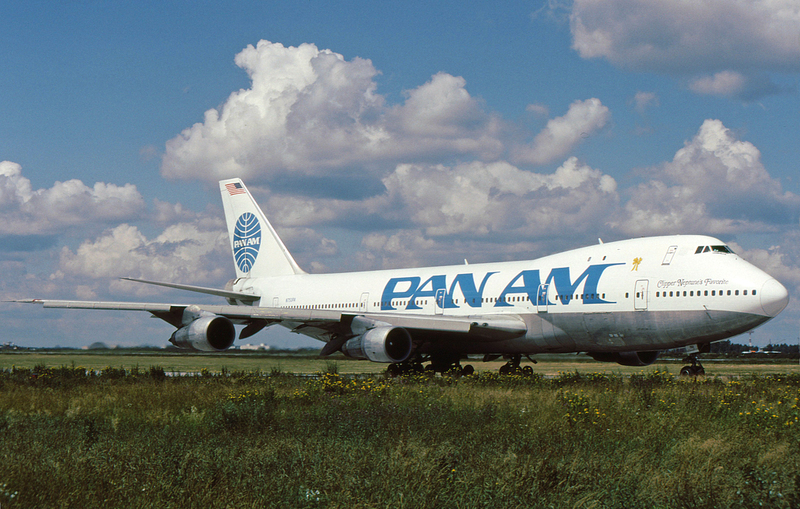 In 1978, Pan American discontinued operations in the USSR as part of a cutback on its European flights. 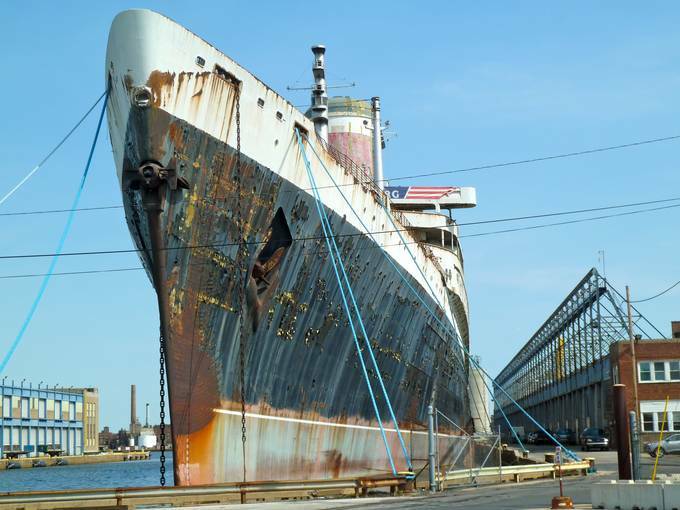 The load factors were low and this was largely attributed to its inability to gain market share. 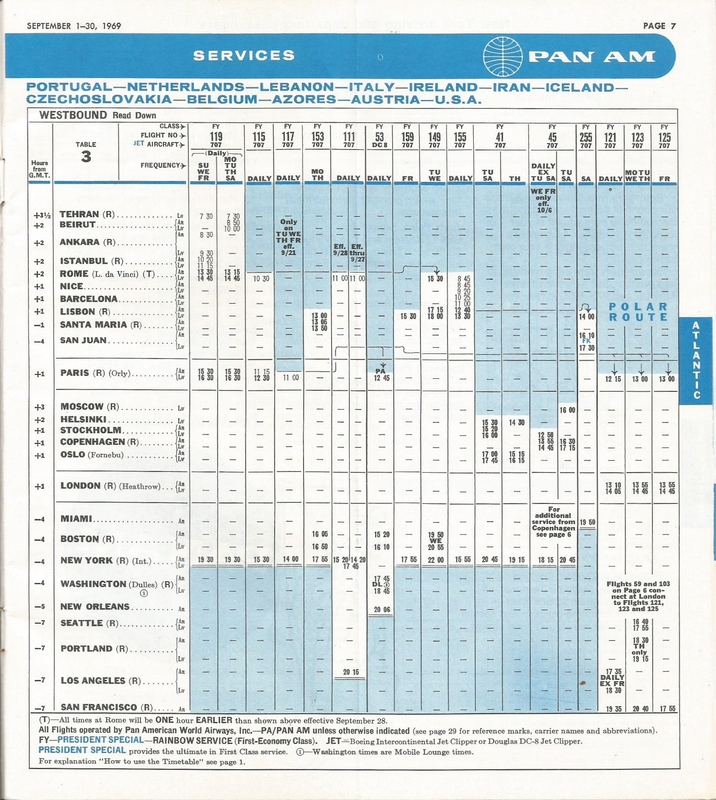 Quite simply, Soviet citizens could not buy Pan Am tickets. 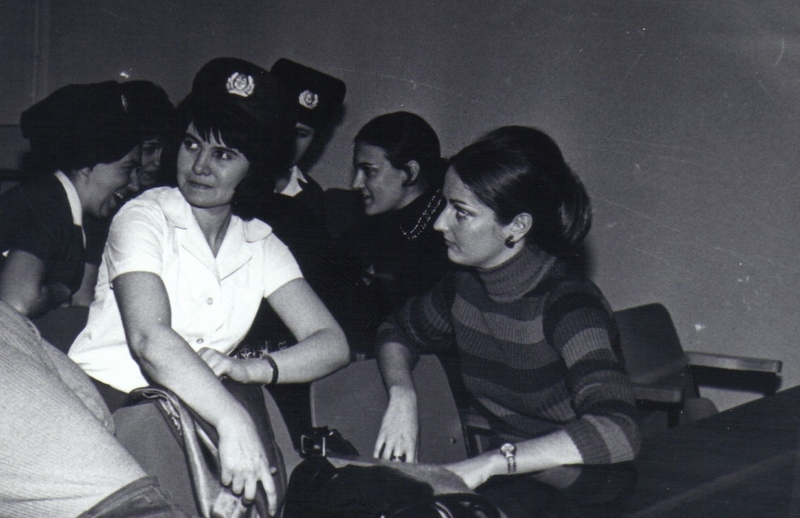 In order to obtain their papers to travel abroad, Soviet citizens were required to hold Aeroflot tickets. 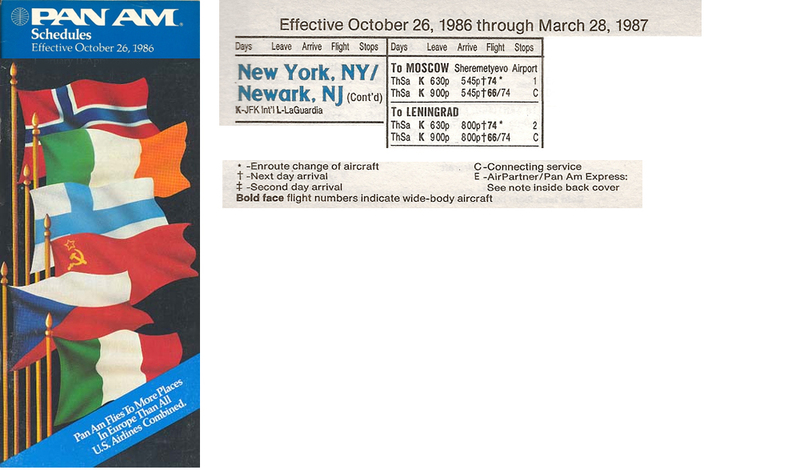 In addition, Aeroflot would undersell Western airlines to earn hard currency. 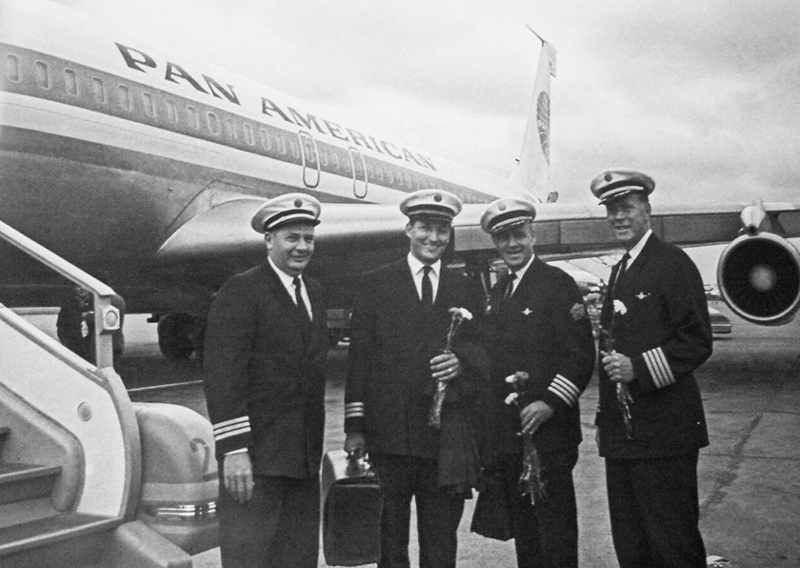 After Pan American discontinued operations, Aeroflot continued its Moscow-New York service. 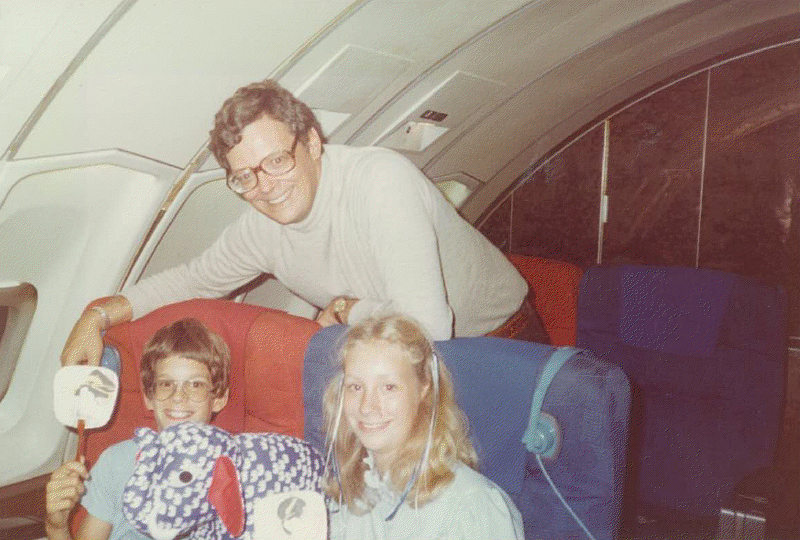 However, under President Carter, Aeroflot service was reduced to two flights per week, effective January 13, 1980, as part of a response to Soviet military actions in Afghanistan. 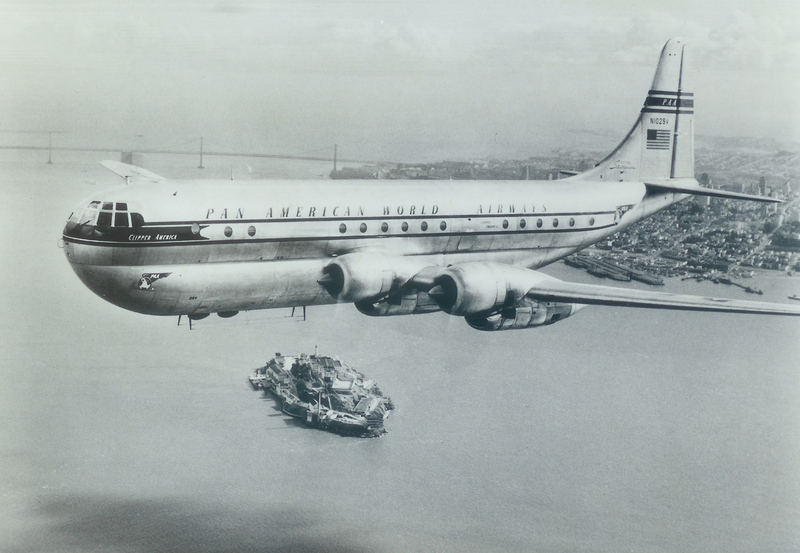 “The first New York-Moscow flights made one stop on the way – Montreal for Aeroflot and Copenhagen for Pan Am. 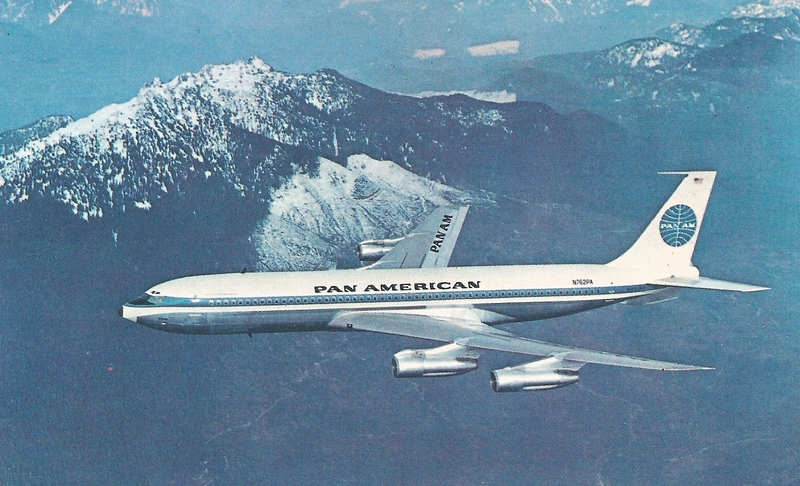 Shortly before Pan Am’s first scheduled flight, another Pan American 707 “protocol” flight, with Government officials and VIP guests took off. I remember suggesting to New York that the person with the most impact possible to be invited as an inaugural guest would be Jacqueline Onassis. Secretly, the Russians loved John F. Kennedy. 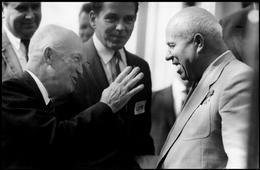 He had stood up to Khrushchev and made him back down! Jackie Onassis would have been a sensation. 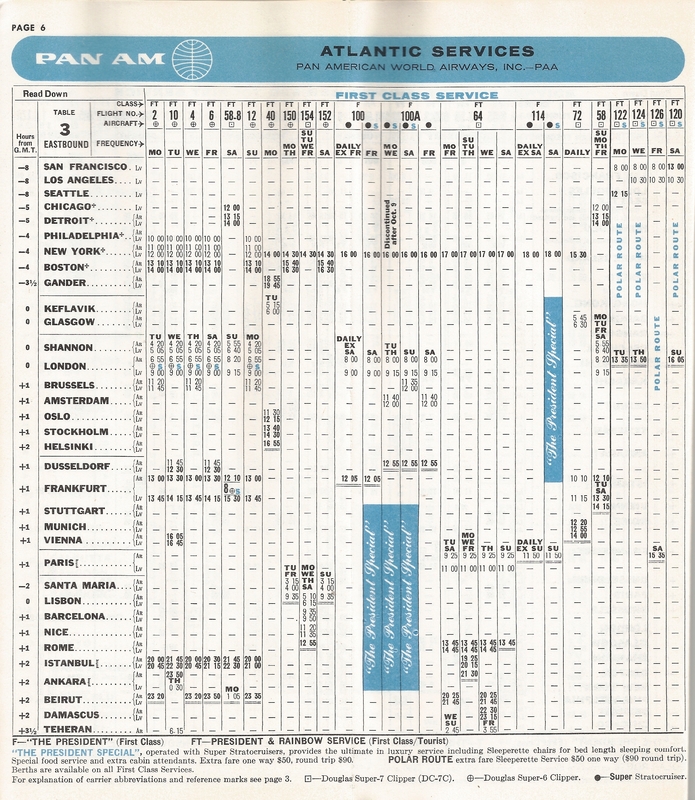 “Pan Am’s initial weekly flights were 10 hours 50 minutes eastbound – 11 hours 45 minutes westbound. 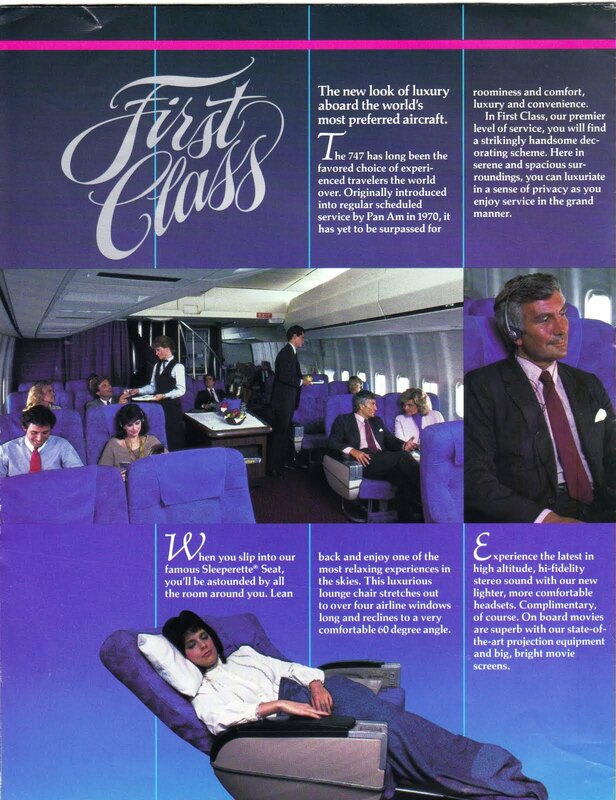 First class fares were $584 one way, and $1,109 round trip. 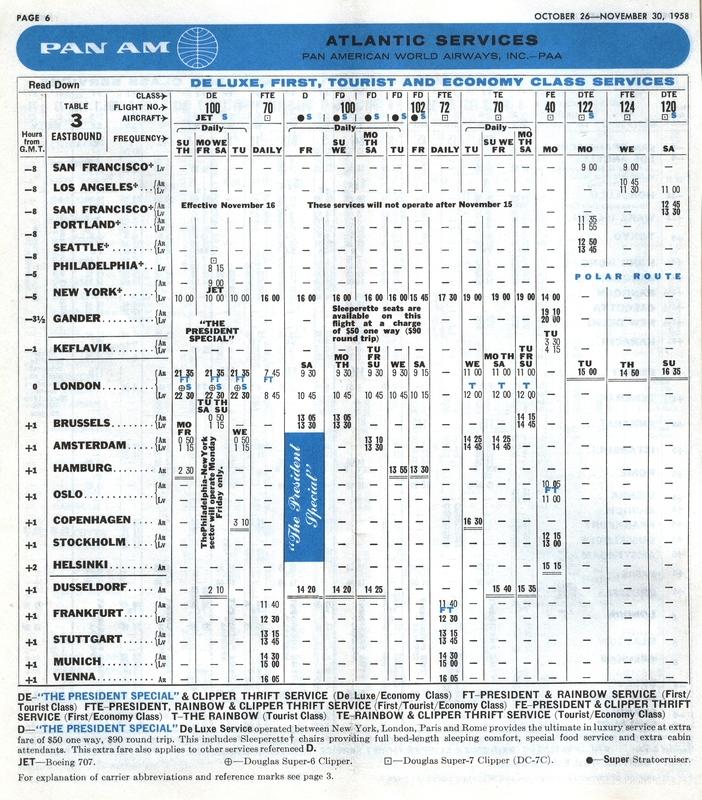 Economy fares were $384 one way off season — $429 during the summer peak. 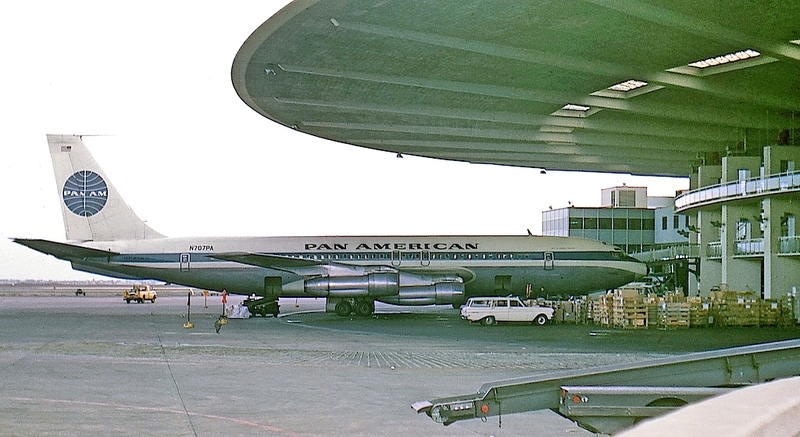 “Pan Am’s operation, very efficiently led by Airport Manager, Walter Nelson, at Sheremetyevo, had a much greater impact than its relatively low initial schedules would have indicated. 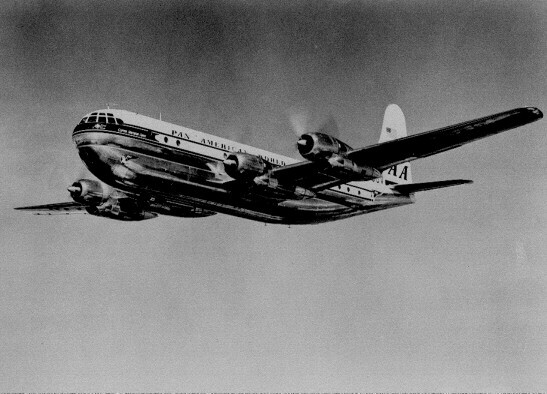 An analysis of the flights to Moscow by themselves could show a money losing “National Interest” route, but if incremental trans-Atlantic traffic, connecting over other gateways, was added, the Moscow operation was quite successful. 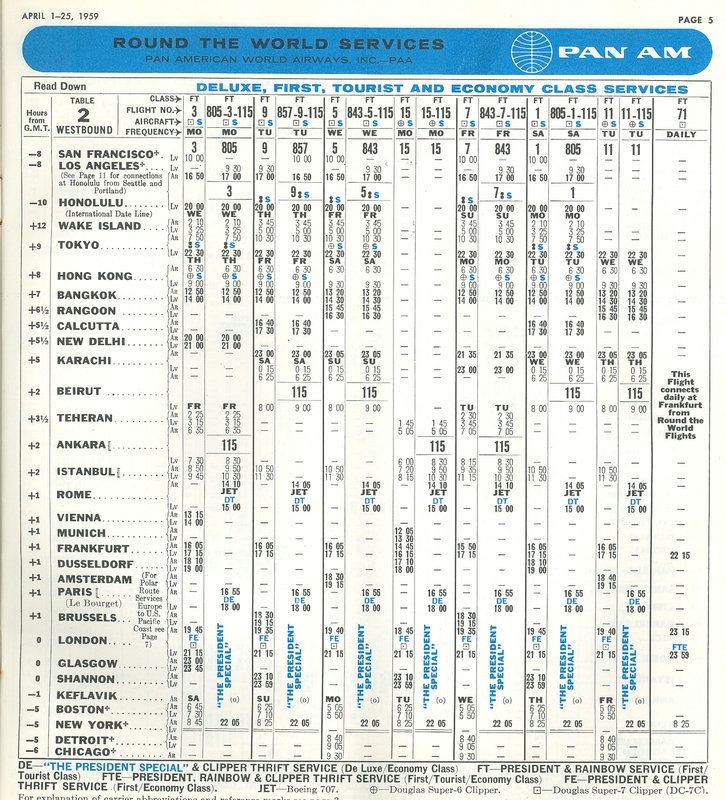 Most connecting passengers would not have called Pan Am if we had not been serving Moscow. 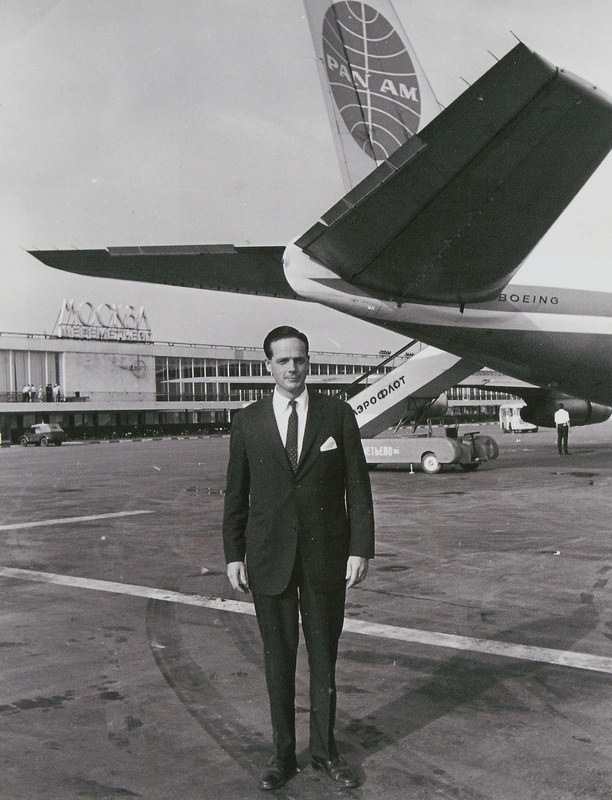 “In spite of constant ‘stealing’ of our passengers by rank and file Aeroflot employees, we managed to generate more Moscow originating trans-Atlantic traffic than other western airlines. Aeroflot would not help pending passengers until the long exit and entry visa processes were completed. 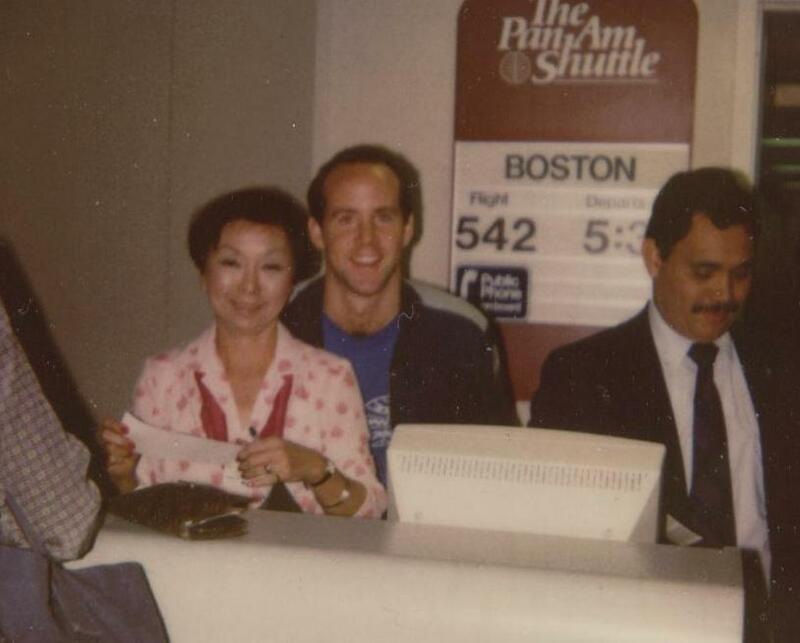 The wife of the US Consul came to work for Pan Am, giving us access to visa applications. 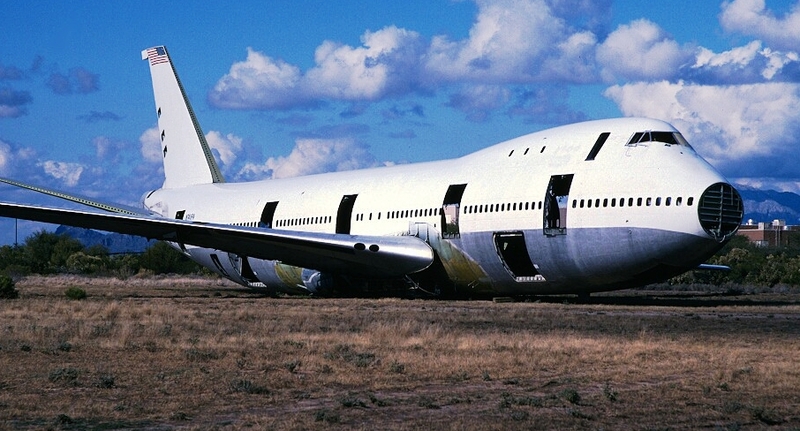 We were able to help Russian passengers early in the visa process. Many of them had prepaid tickets, paid for by relatives in the U.S.
“All tickets had to be issued by Aeroflot’s Moscow reservations office. It was called the Central International Agency – until I pointed out that was ‘CIA’ They changed the name! 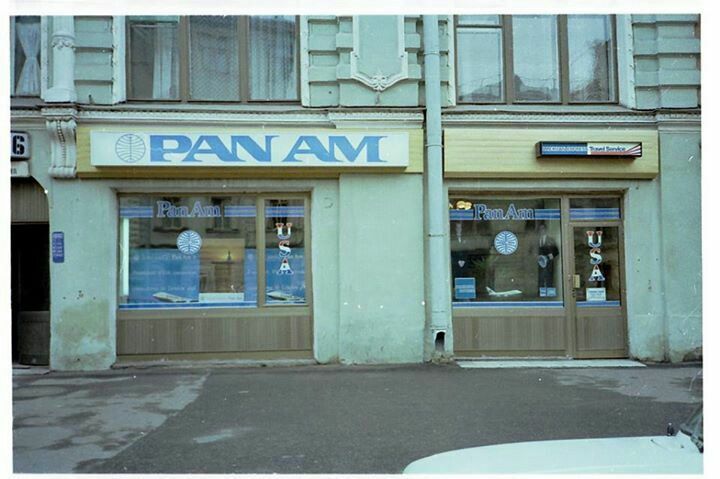 “No advertising signs were permitted on the outside of buildings in Moscow in those days. Our corner office on the second floor of the turn of the century Metropol Hotel had two huge bay windows. We ordered two large signs (white squares, with huge Pan Am blue balls, some seven or eight feet across), and mounted them on the inside of the large bay windows, directly across a square from the Bolshoi Ballet, in the center of Moscow. With no other advertising signs, and, particularly, no other American signs, in the center of the city, this caused quite a stir. 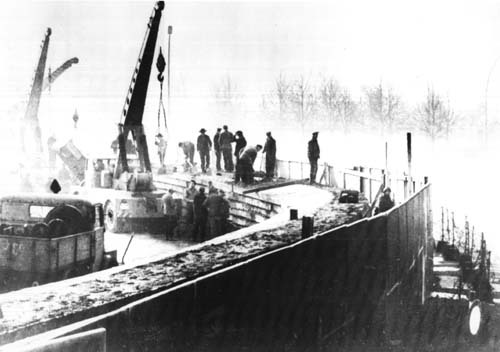 “Moscow city officials were bemused, but chagrined. We were not advertising on the outside of the building in violation of their regulations, and they empathized with this ‘manipulation of the system.’ ‘We see what you’re doing!’ Moscow bureaucrats did not know much about New York. We assured them, if they let us keep our signs, we’d make sure that Vladimir Samaroukov, Aeroflot’s manager in New York, would be permitted to put up Aeroflot signs there! 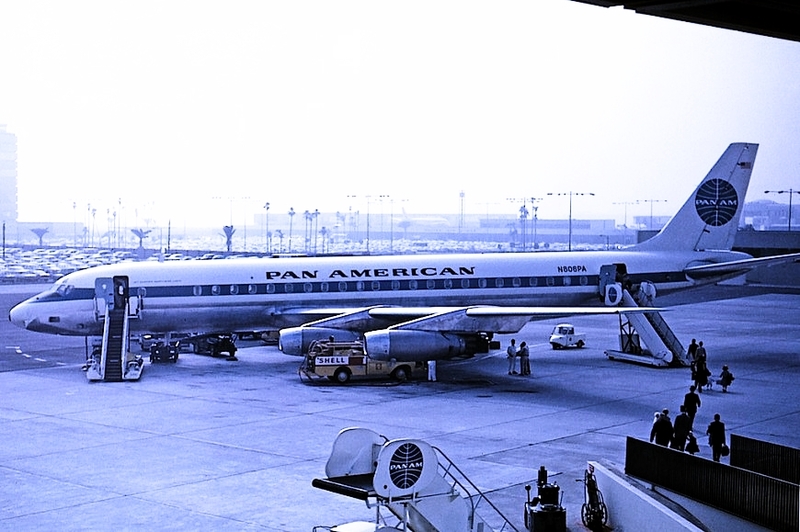 We waited a month or so before turning on the lighted Pan Am signs. By then it was clear to all that an American Company was firmly ensconced in the heart of Moscow – unheard of until that time. 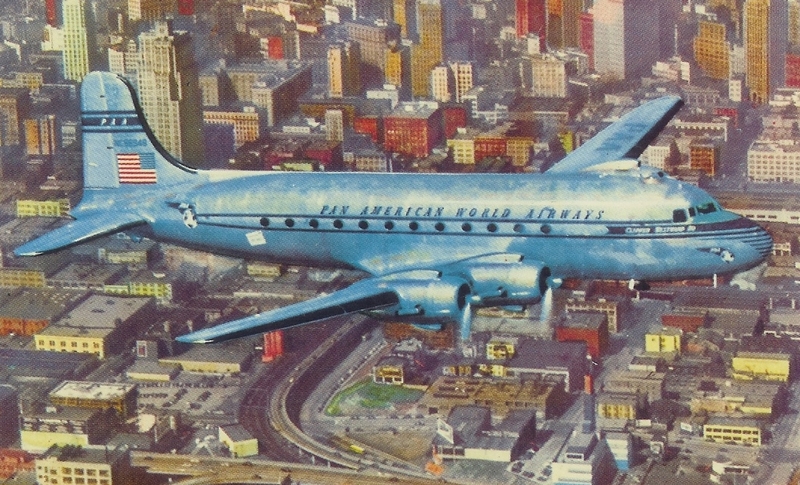 To help cement the arrangement, we may have asked the bureaucrats to help us distribute a few boxes of Pan Am calendars. 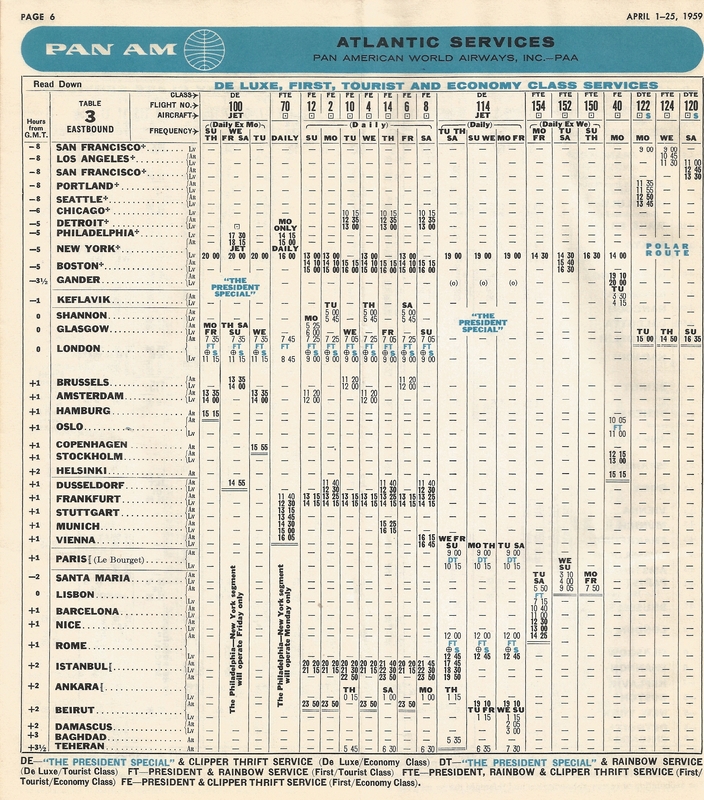 “As a symbol of confidence, Pan Am had a custom of bringing the entire Board of Directors, with the wives or husbands, on the same airplane for board meetings at different locations around the world. The Board decided to come to Moscow. Preparations were exhaustive. We even had my good wife, Janet, do a survey of ladies’ rooms in areas we planned to take the Board. Intourist was helpful, but, as the Russians say, the reason Napoleon failed in Russia was because his plans were made by Intourist! 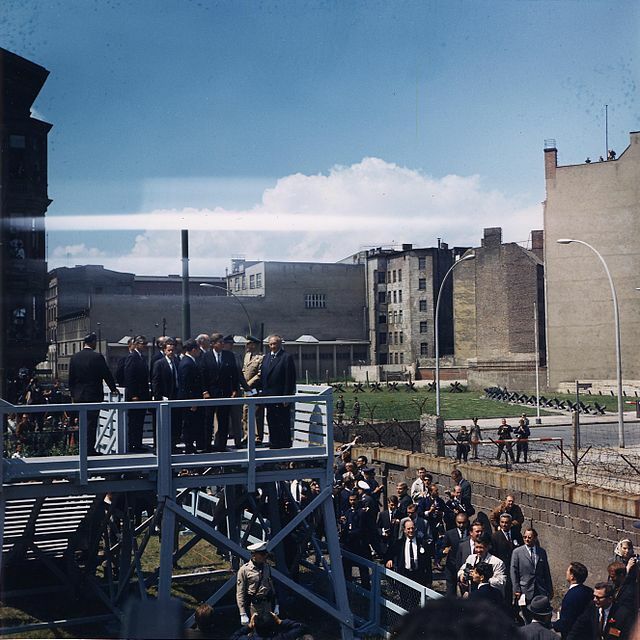 “We arranged a private meeting between Minister Loginov and Juan Trippe. I was privileged to attend. 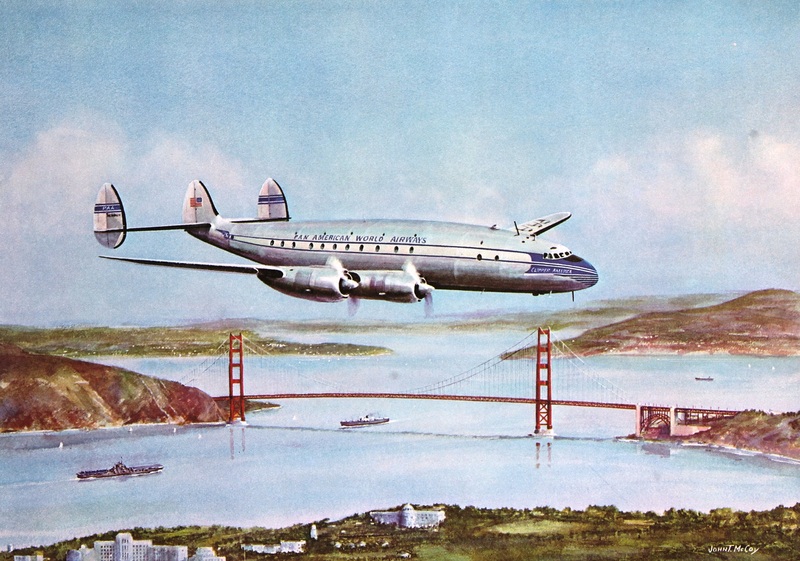 Although nothing had yet leaked to the press, Mr. Trippe confided to Marshal Loginov that Pan Am had decided not to go forward with supersonic operations, but, instead, to develop widebody aircraft. Loginov was stunned. 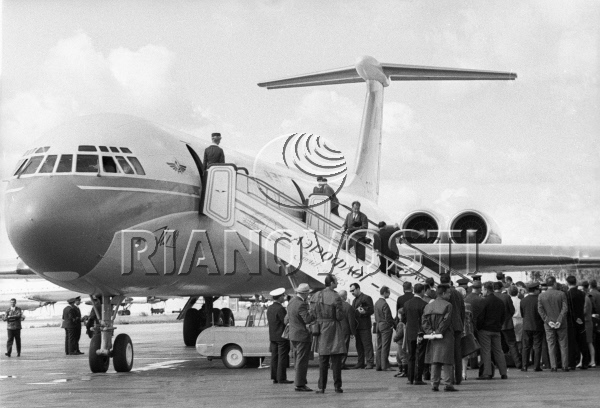 Aeroflot and the Russians had clearly put all their emphasis into developing their version of the supersonic Concorde. 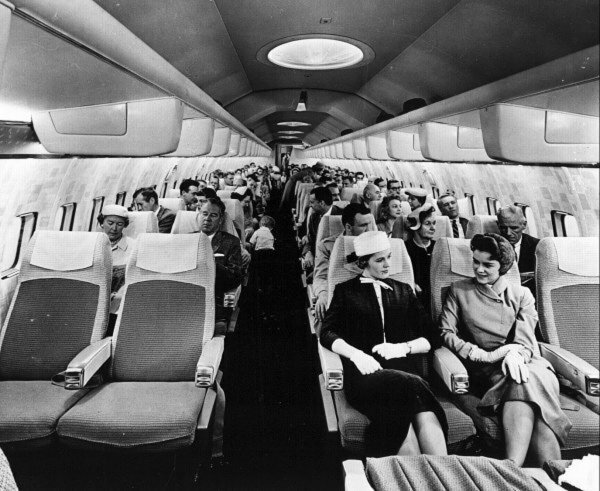 Suddenly, they feared being left behind by the airlines of the world following Pan Am with wide-bodies. 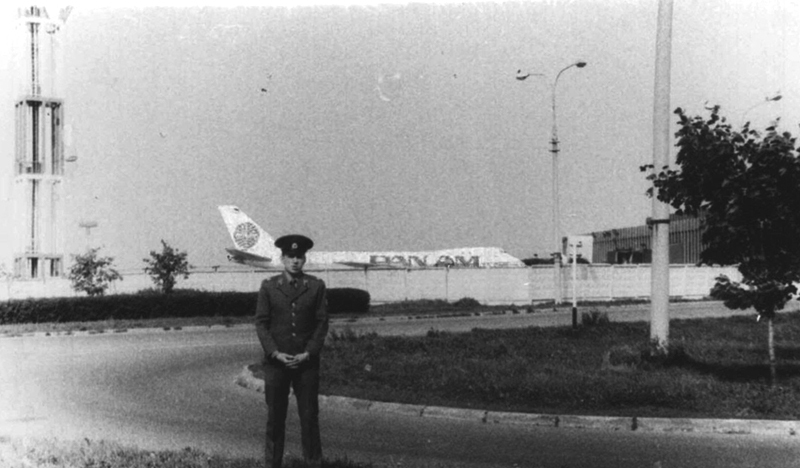 “The afternoon of January 12, 1971, as the Pan Am Clipper flight 44 makes its final approach to Moscow’s Sheremetyevo Airport, I glance down at snow-covered fields framed by dark lifeless bushes and trees. Here and there I can make out a house forlorn in the vast wintry Russian landscape exuding the melancholic mood of the Russian soul so often described in the works of Tolstoy and Pushkin. Tired from an all-night flight starting in New York via Copenhagen, a sense of excitement drives away my feeling of drowsiness. 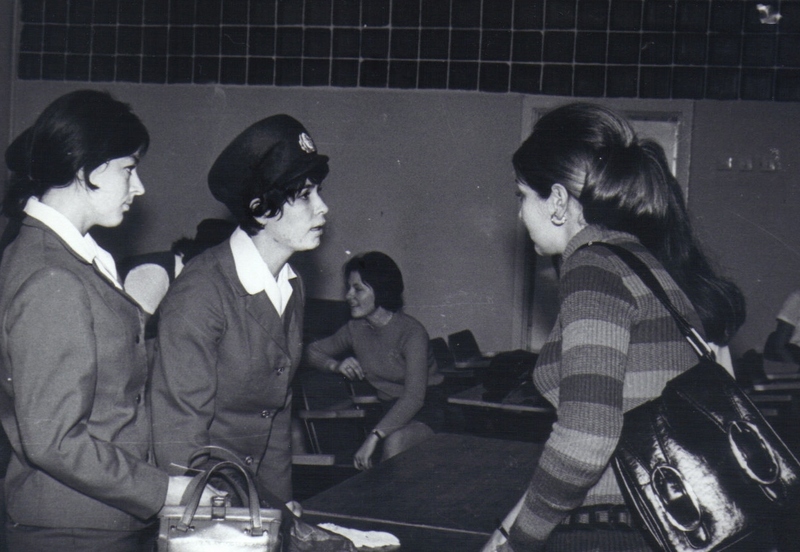 I am one of 31 Pan American stewardesses, who signed up for a Russian language course in Moscow. 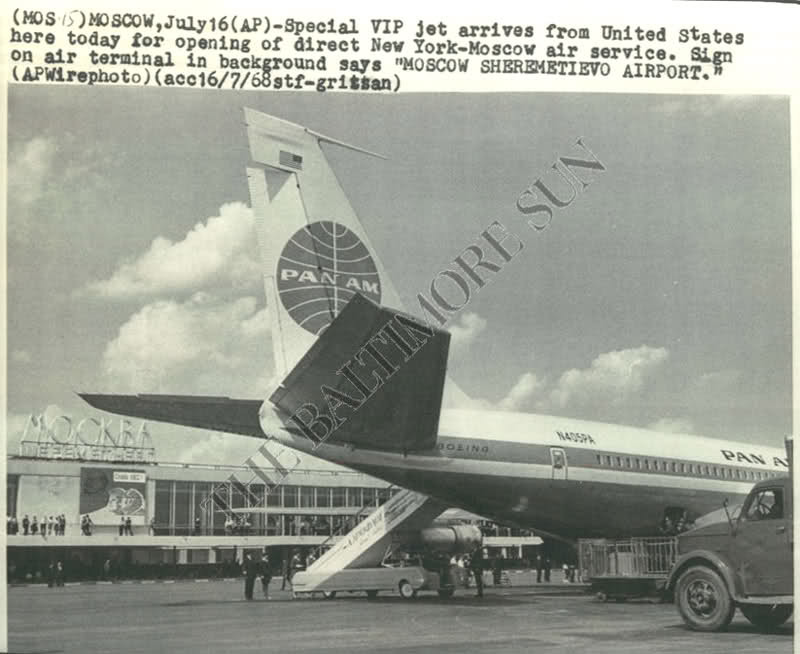 To alleviate the shortage of Russian speaking cabin personnel since Pan Am started operating flights to the Soviet Union in 1968, Pan American arranged this 4-week program at minimal cost of hotel and meal expenses to us, while we agreed to an unpaid leave-of-absence. Within our group of eleven nationalities, (French, German, Swedish, Norwegian, Israeli, Yugoslavian, Argentinean, Honduran, Uruguayan, Dutch and American,) I am one of the few with a background of studying Russian at Hunter College, in the hope of eventually adding it to the other four languages (French, Italian, Dutch and German) I am qualified to speak on board. 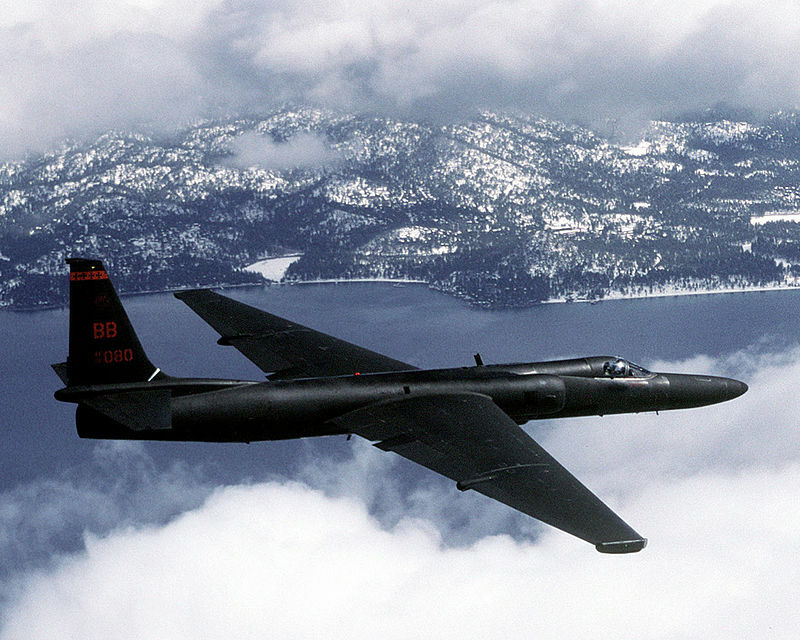 Federal Air Regulations required at least one person to be able to communicate in the language spoken at the destination country of every flight. 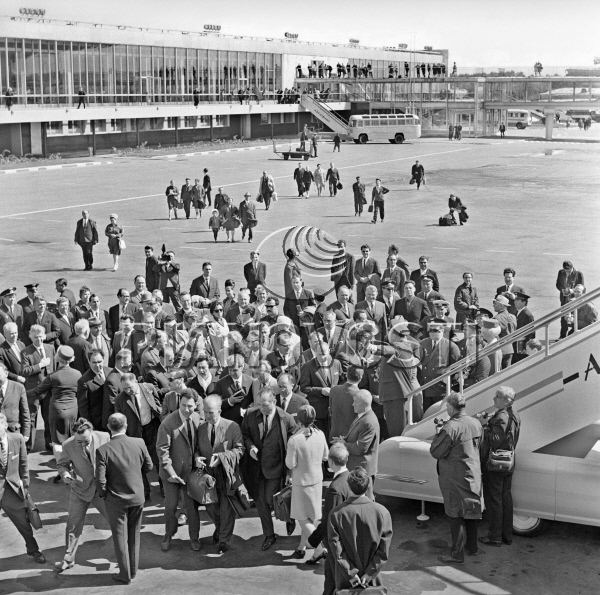 “We arrive at the Hotel National in time for dinner, served from 6:30-7:30 p.m. A babushka (grandmother) who occupies a desk on every floor hands me the room key and, as we observe from then on, notes down every one of our movements, an outcome of the ongoing Cold War. My room, which I share with my Swedish friend, consists of two single beds separated by a table. Heavy curtains hide the view from the window. A single light bulb dangles from the high ceiling and gives off enough light to reveal the cracks in the lime green walls. When I go to take a long bath, I discover no stop in the tub, and a shower head is non-existent. 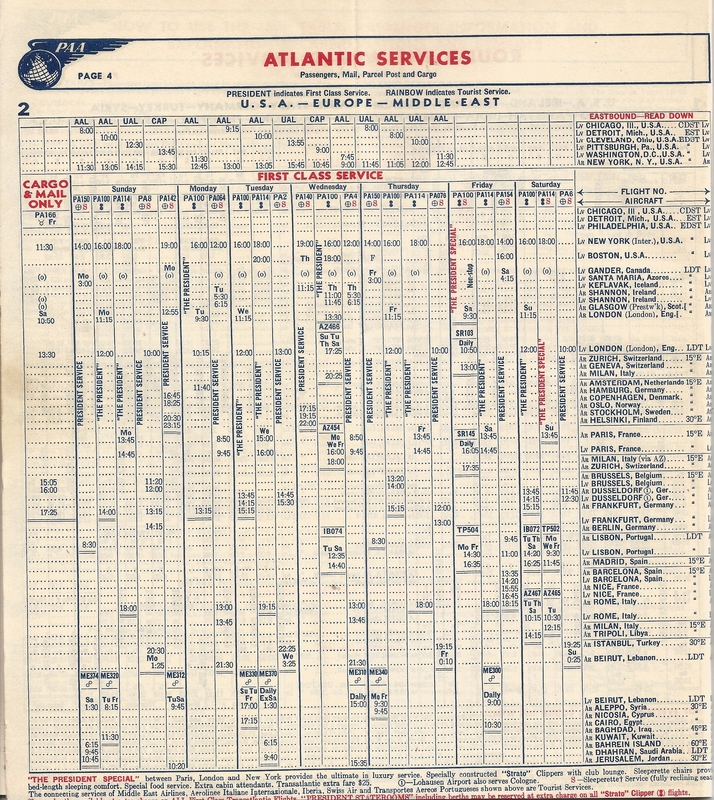 “Our daily schedule allows for little idle time, starting with breakfast between 9 and 9:45, lessons at the department for foreign students at Moscow State University from 10 to 1, followed by lunch from 1:30-2:30, and excursions on most afternoons. Bus transportation is provided by Moscow’s Intourist Office. Every second day drivers are exchanged for fear we might become too friendly with them. “We attend a fashion show where we get an authentic taste of life in the Soviet Union, where Russian models present lackluster and unappealing outfits. We visit Moscow’s Wedding Palace to witness a line-up of grooms in dark suits and brides in frilly white dresses ready to take their vows. 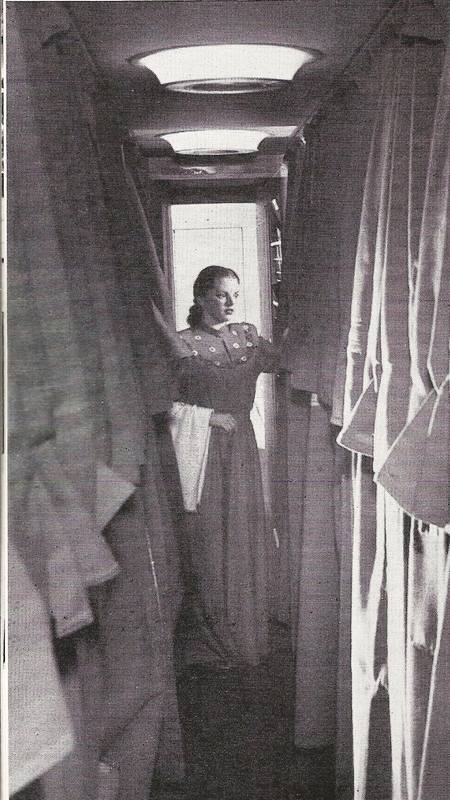 We sleep in bunk beds on a night train for a weekend in Leningrad (now St. Petersburg) and wonder what is so important to hide from our view, that the windows had been boarded shut. 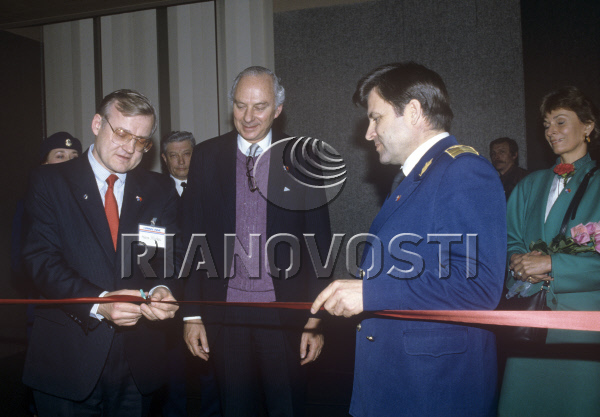 “Although interchange with Russians is strongly discouraged, we attract the curiosity of young people. Among the drab colors worn by everyone in Moscow we stand out in our fashionable attire . “The minute we climb the stairs to the main hall, two men emerge, grab the young students by their arms, shouting in Russian: ‘Rusky nyet’ (No Russians). “’All we want to do is talk,’ I plead. “One afternoon, my roommate and I walk up to the roof-top terrace on the 23rd floor of the Russia Hotel for a postcard view of Saint Basil‘s Cathedral and Red Square. Raising my camera for a photo, a male voice screams from behind: ‘Stop, or you will be arrested.’ In a frenzy we make a run for a lady’s room where I quickly remove the film before a uniformed man enters. Terrified we endure a tirade of reprimands. Finding my camera empty he lets us go. I had forgotten that we are never to take photos from high places. “Despite some anxious moments, the highlights of our stay are the cultural events. Every evening we occupy the best seats at one of the theaters or concert halls. During intermission at the Bolshoi or Kremlin Theatre we savor dishes of mushrooms in cream sauce or ice-cream topped with loganberries. Never again will I see a performance rising to the level of perfection and beauty as at the Bolshoi Theater. 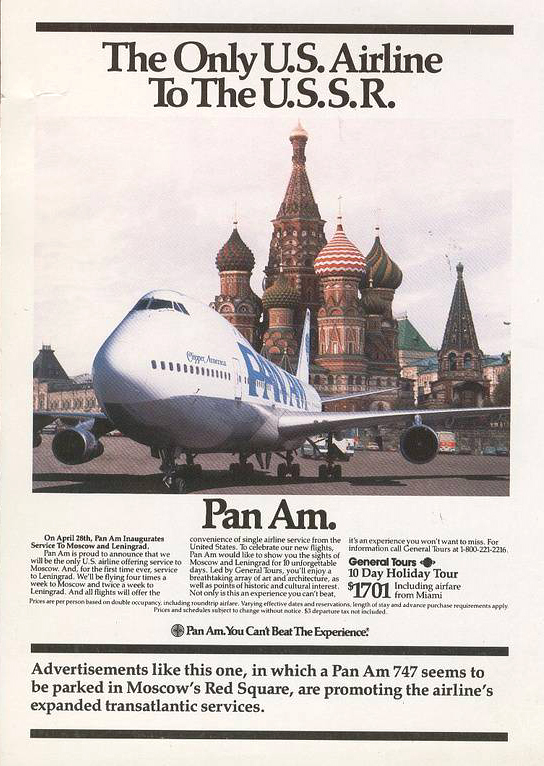 In the next posting, Pan American re-instates its Moscow service in 1986 and introduces a 747 nonstop rotation in 1988. 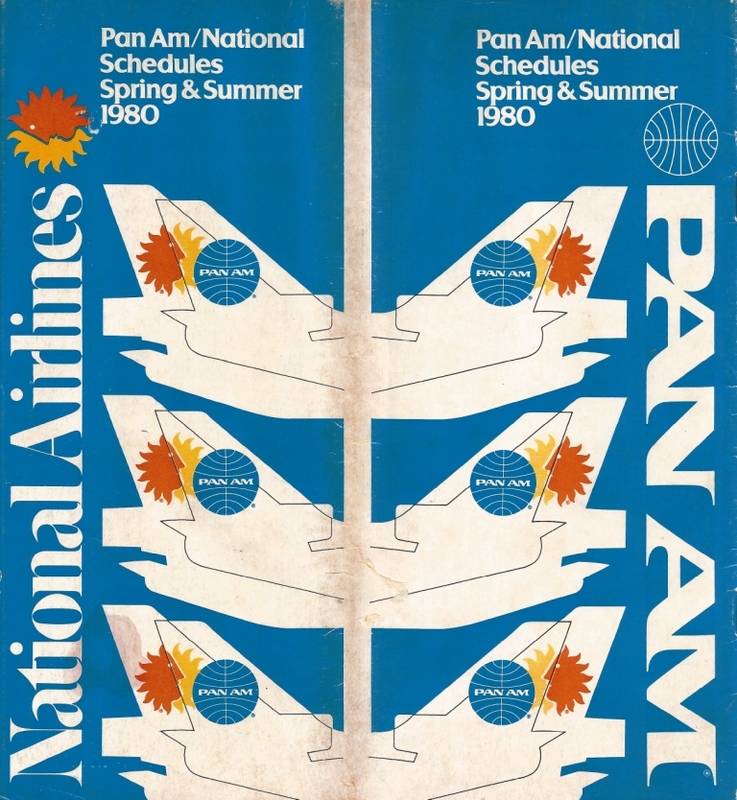 The Pan Am Shuttle was inaugurated on 1 October 1986 in direct competition with the legendary Eastern Shuttle that had been in operation since 30 April 1961. 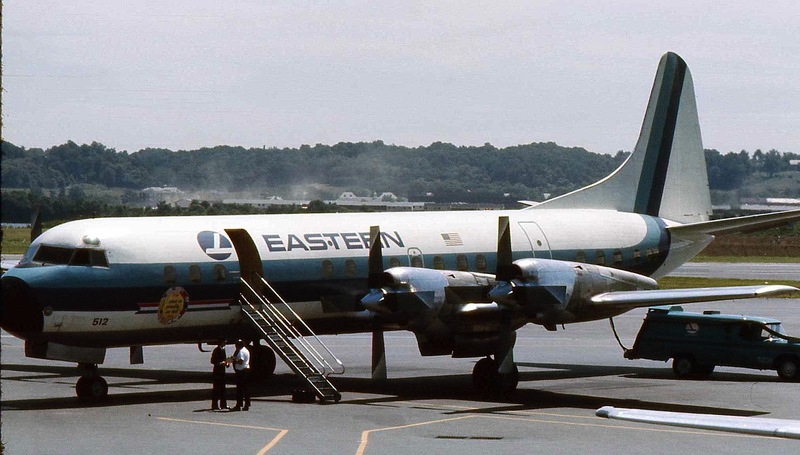 The Eastern Shuttle began with the Lockheed 1049 Constellation and operated between New York LaGuardia , Washington National and Boston Logan every two hours between 8 a.m. and 10 p.m. 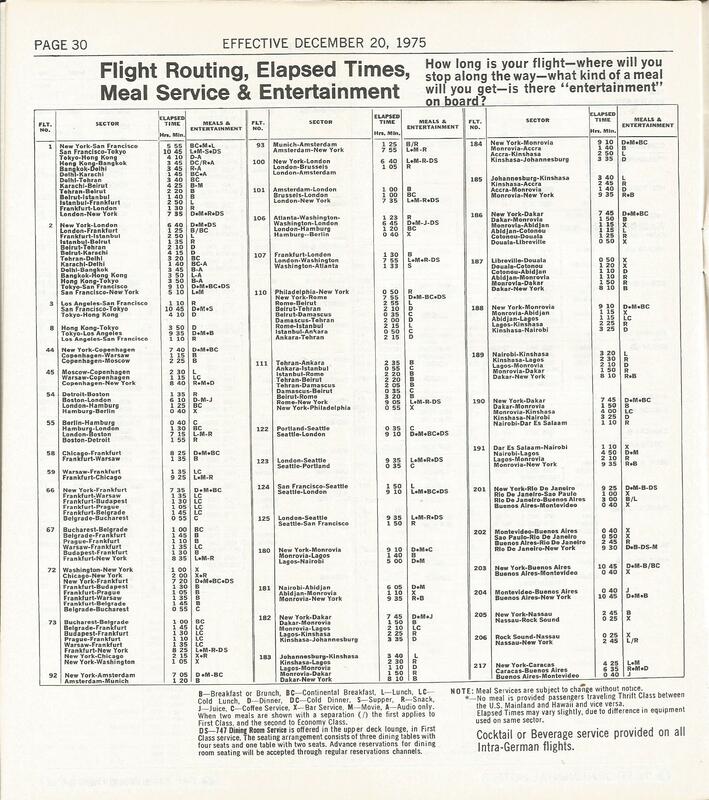 The service later became hourly from 7 a.m. to 10 p.m. The shuttle required no reservations, there were no seat assignments, no check in was required and no boarding passes were issued. 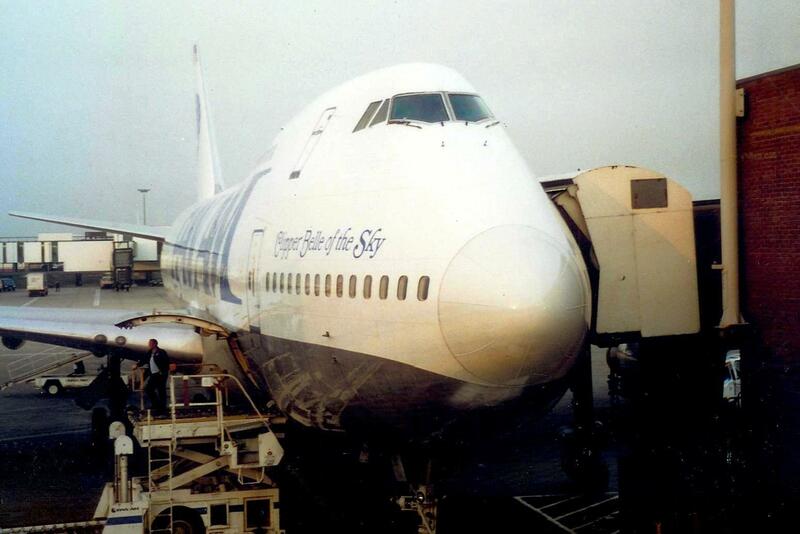 In other words, a passenger simply went to the airport and boarded the aircraft. 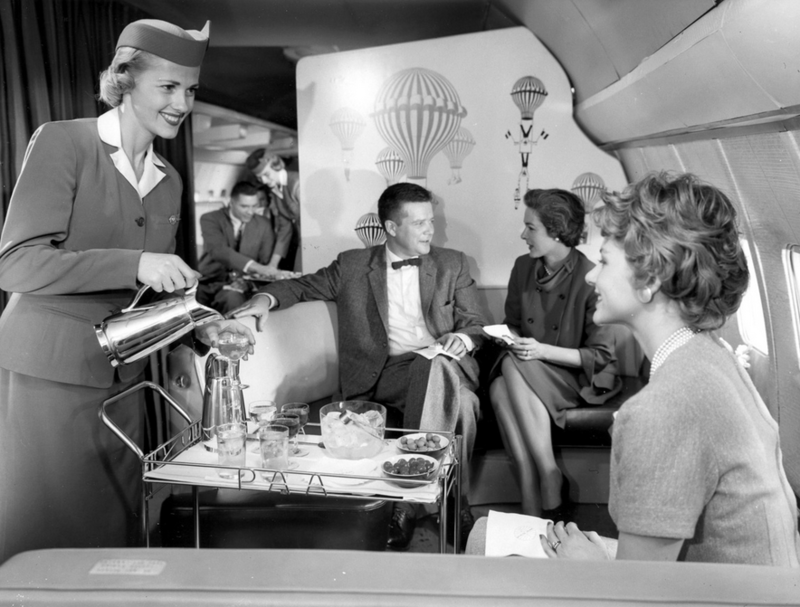 Tickets were purchased on board after takeoff and there were no drinks or meal service. 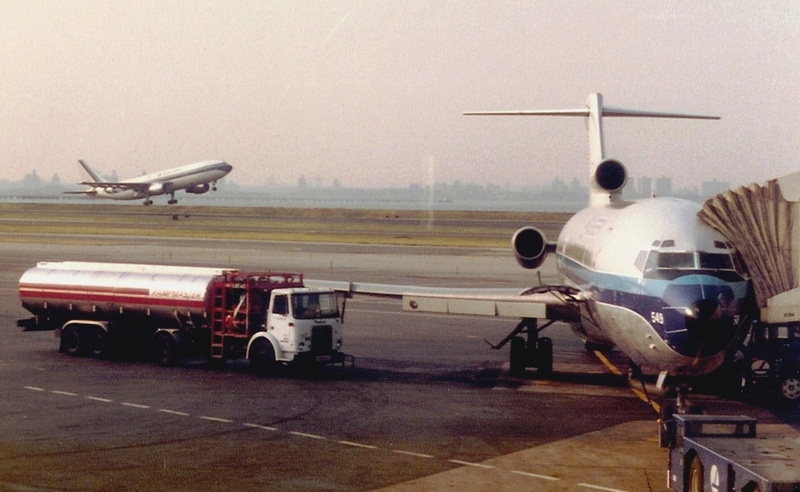 The Constellation was eventually replaced by the Lockheed Electra, which was replaced by the DC-9, which was replaced by the Boeing 727-200, pictured above at its LaGuardia gate (left). 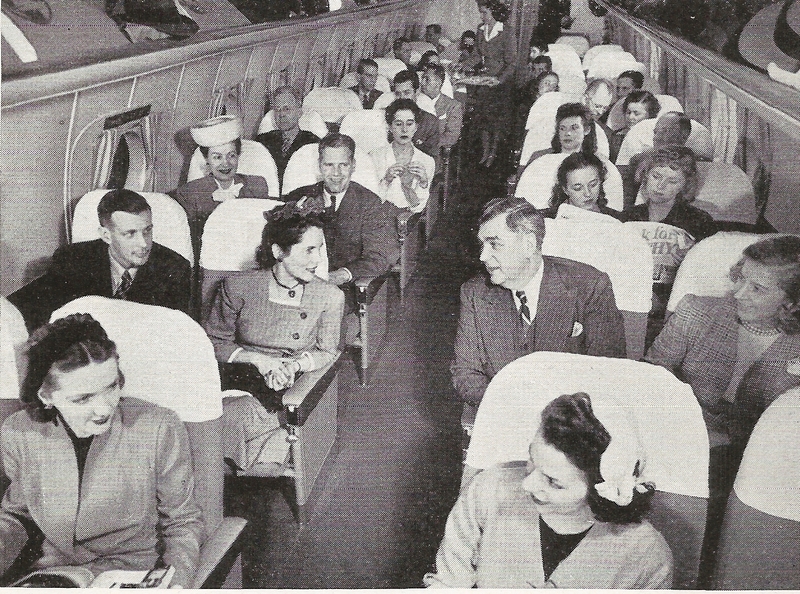 One feature of the Eastern Shuttle was that every passenger was guaranteed a seat. 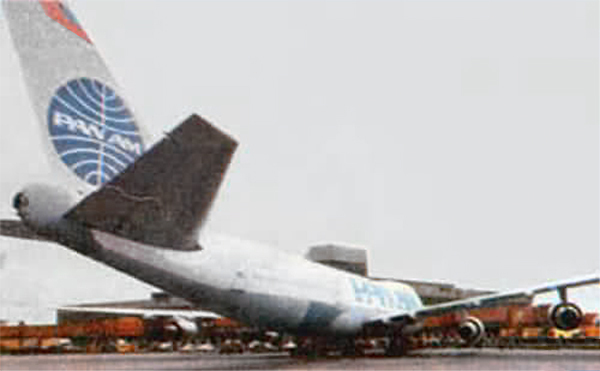 If a flight was full, a back-up aircraft was ready to go. 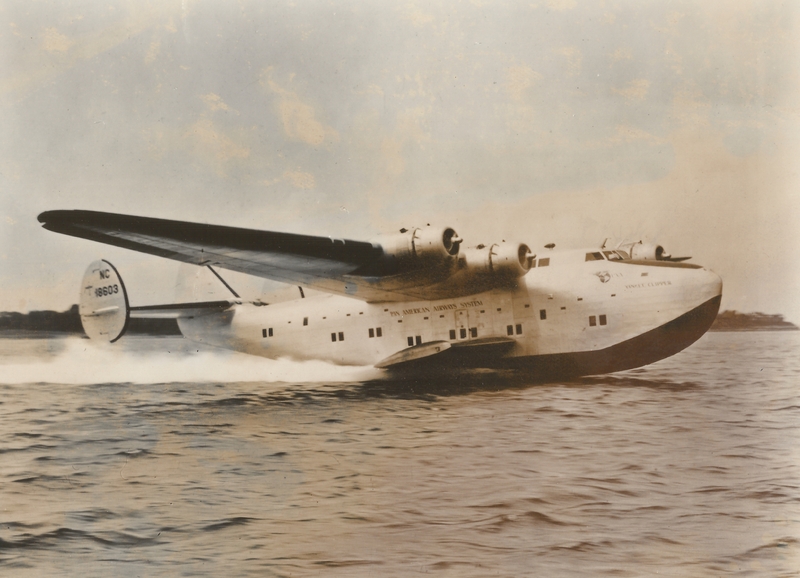 As legend has it, there was once a single passenger who arrived for a flight on time and as it was full, was accommodated by a back-up aircraft. 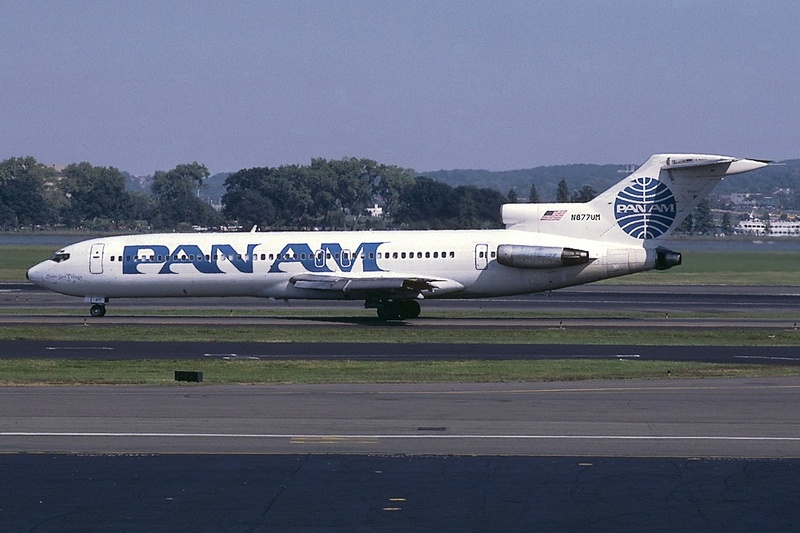 Later, the USAir Group acquired 40% of the operation with an agreement to manage it and also an option to eventually acquire the entire entity. 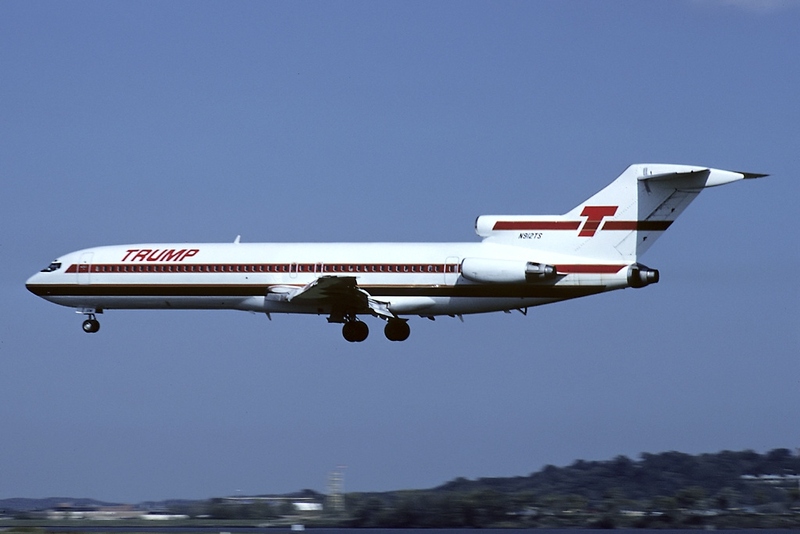 In April 1992, the Trump Shuttle ceased to exist when it was merged into a new corporation, Shuttle, Inc., and began operating as the USAir Shuttle. 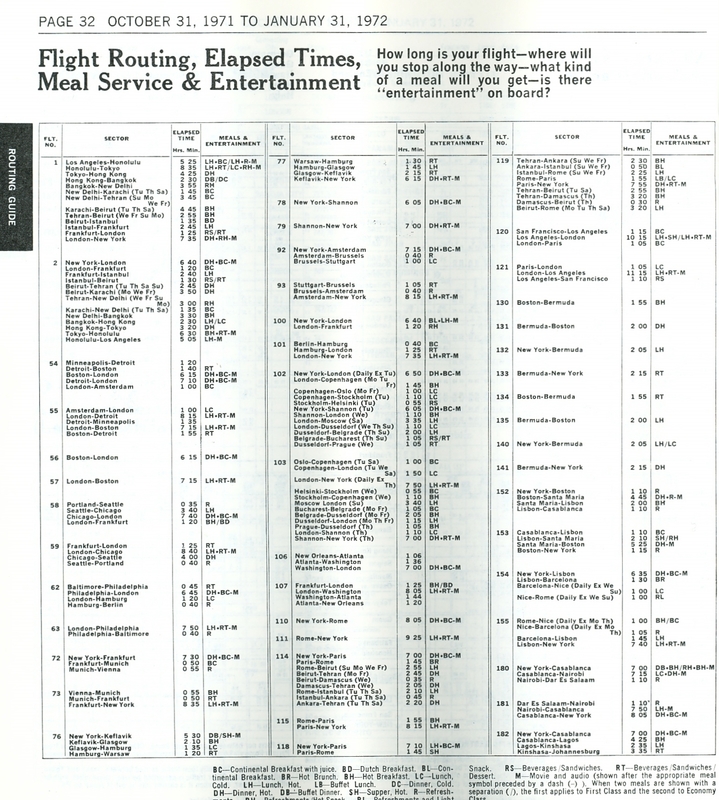 In 1997 US Airways purchased the remainder of Shuttle, Inc., and began operation of the US Airways Shuttle, that continues to today. 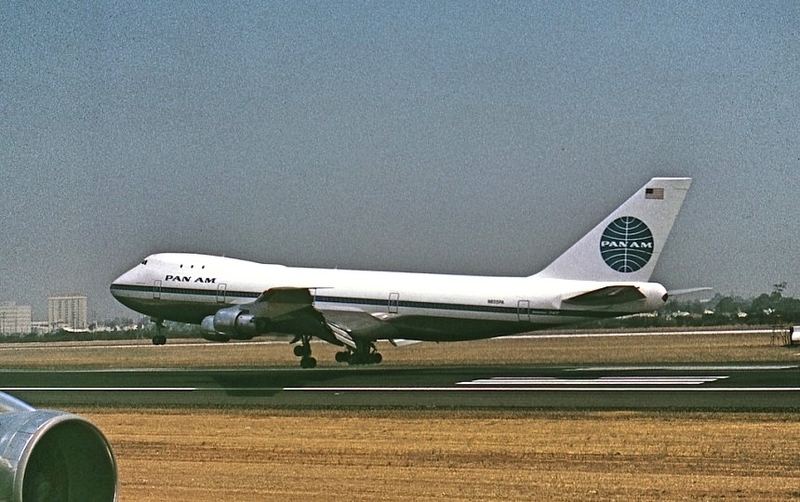 The story of the Pan Am Shuttle had its roots shortly after the US airlines were deregulated when, in 1980, the Frank Lorenzo-owned Texas Air Corporation formed start-up, non-union New York Air to compete with the Eastern Shuttle. 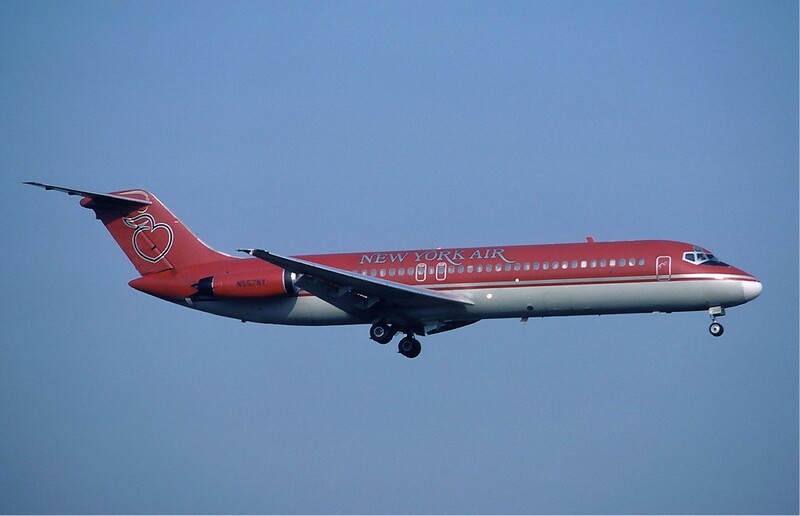 The new airline used DC-9-30s and later MD-80s on the Boston-New York-Washington shuttle route and also offered popular in-flight snack bags called “The Flying Nosh”. 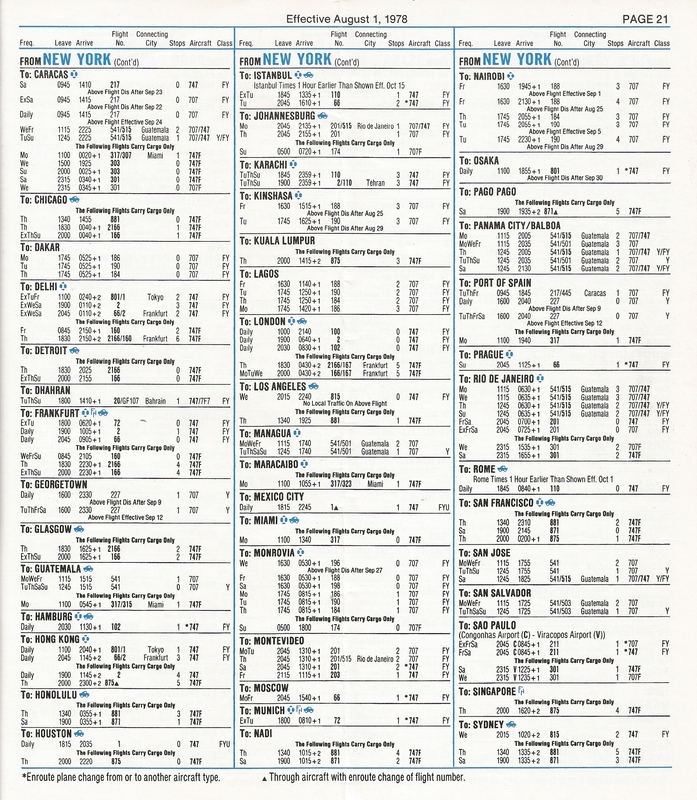 As part of the previously mentioned Texas Air Corporation acquisition of Eastern Airlines and the Eastern Shuttle in 1986, the government required as a condition of the purchase that Texas Air Corporation divest itself of the New York Air shuttle operation. 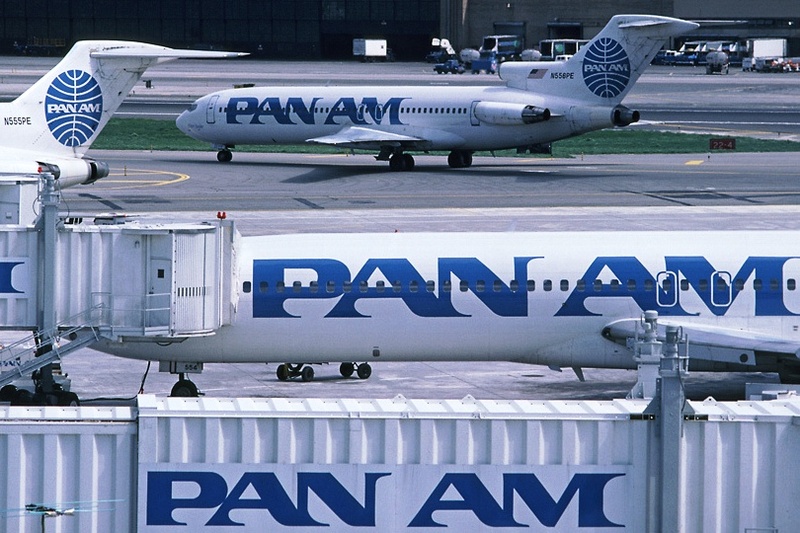 Pan Am, in its attempt to gain a presence in the Washington–New York–Boston air corridor purchased it for $100 million. 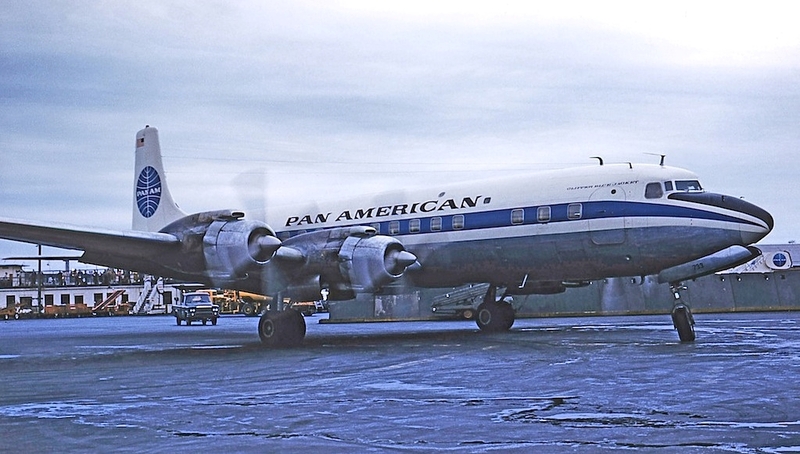 Pan Am also acquired Ransome Airlines (which later became the Pan Am Express). 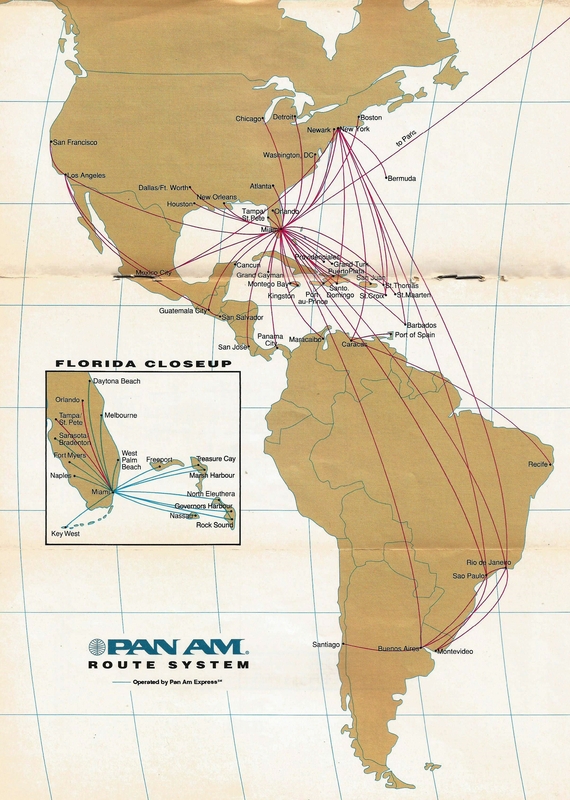 The purchase of the shuttle operation enabled Pan Am to offer a high-frequency service for business travelers in direct competition with the Eastern Air Lines Shuttle. 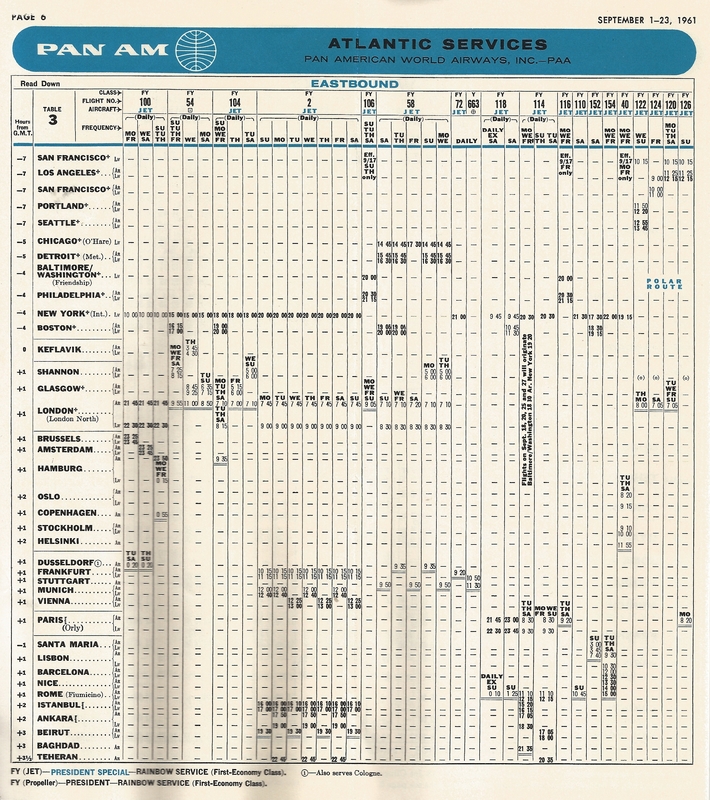 Pan Am’s shuttle operation was different and unique. 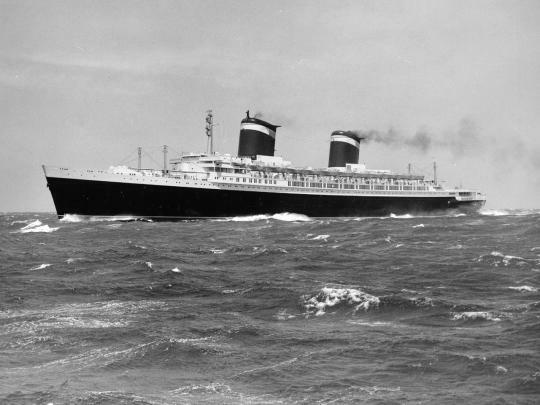 First, it operated on the half-hour, rather than on the hour. 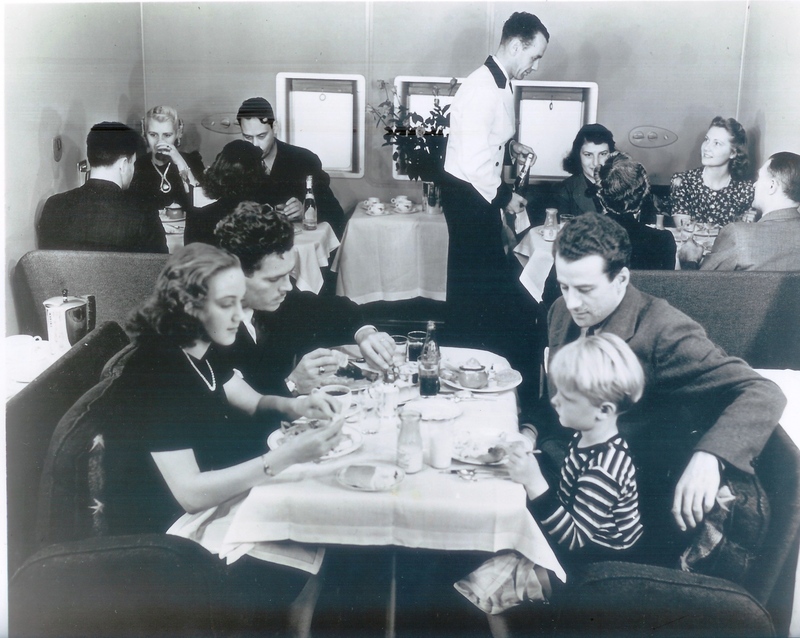 It offered in-flight snacks and beverages and featured Samuel Adams Beer. 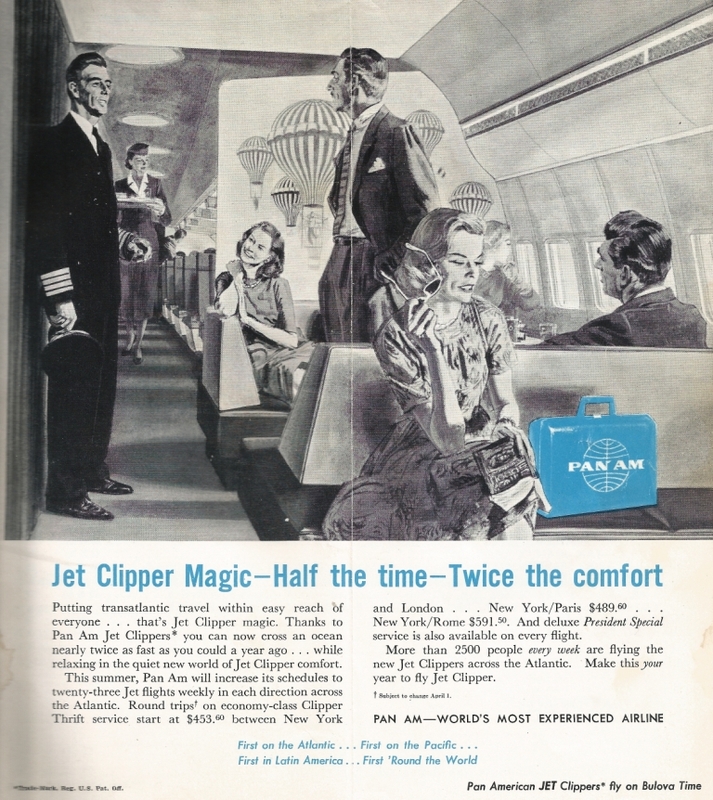 Pan Am went on a marketing blitz when the service was introduced, and differentiated itself from Eastern’s product by emphasizing “Pan Am Service”, recalling the glory days of Pan Am’s world renowned in-flight service. 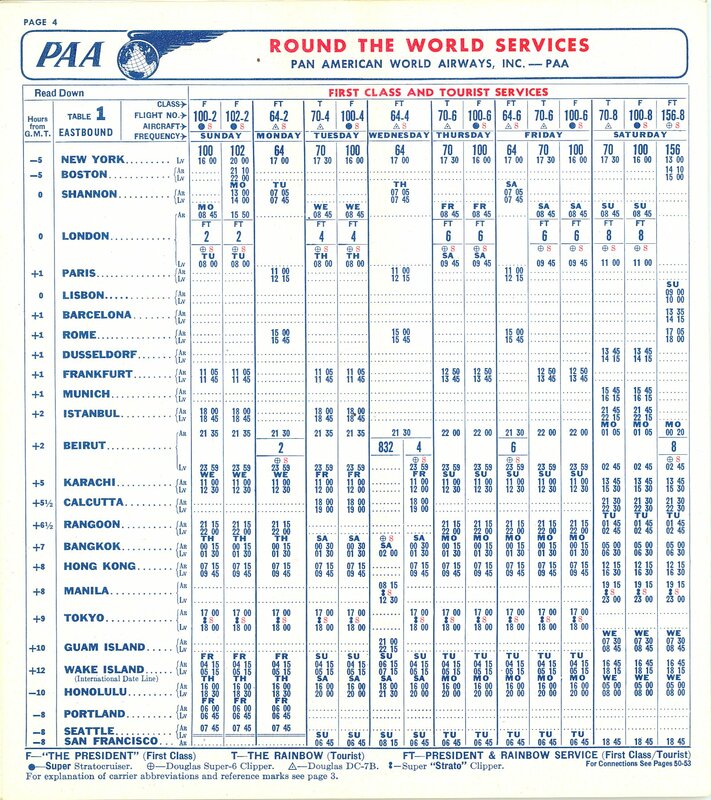 Ticketing was not done on board, rather with ticketing machines located in its terminals at Washington National, New York LaGuardia and at Boston Logan. No reservations were required. 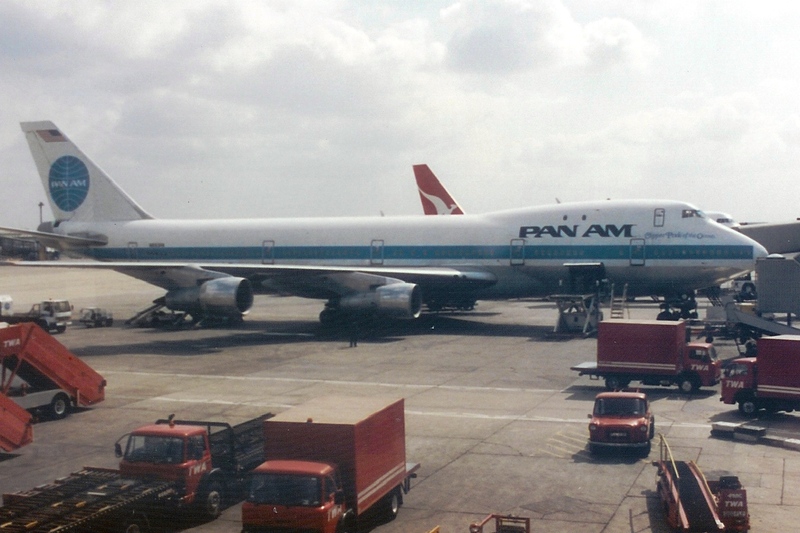 The passenger simply showed up at the terminal, purchased the ticket at a ticketing machine, and boarded the aircraft. The passenger also had the option of checking baggage before boarding, although this had to be done at a regular check-in desk. 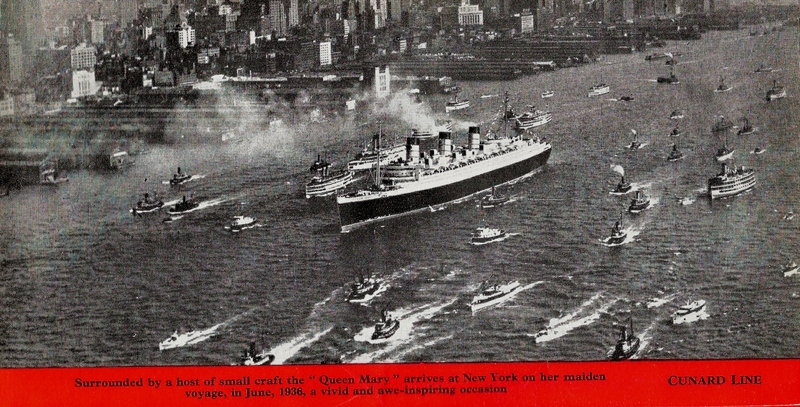 One unique and highly touted feature was that the New York terminal would be the renovated and rejuvenated Marine Air Terminal from where the Boeing 314 flying boats once departed. 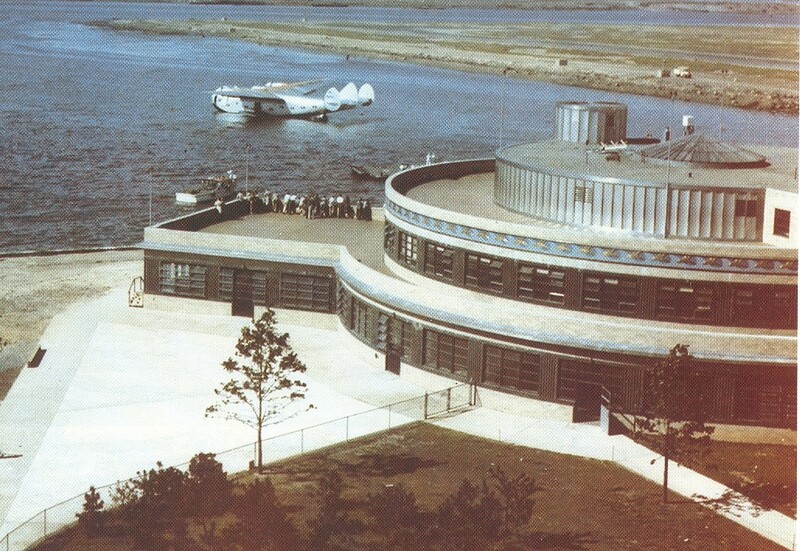 Marine Air Terminal at LaGuardia Airport. 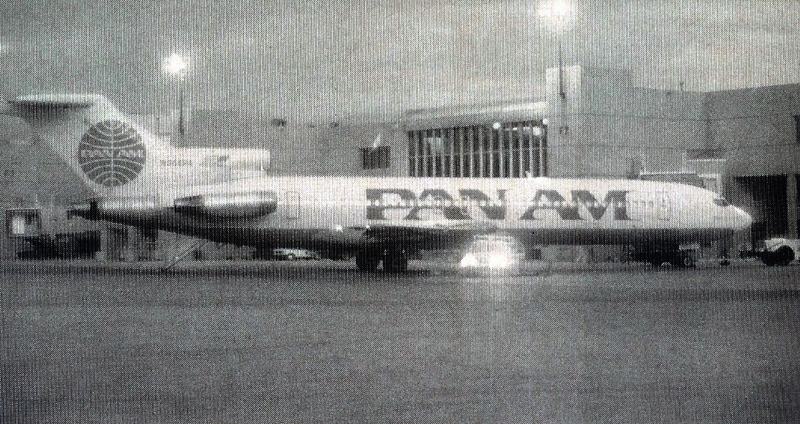 The aircraft used were Boeing 727-200s (pictured at the top of this story, right, photo by Andy Martin), acquired from the defunct Peoples Express and from Lufthansa and were in an all-economy configuration. 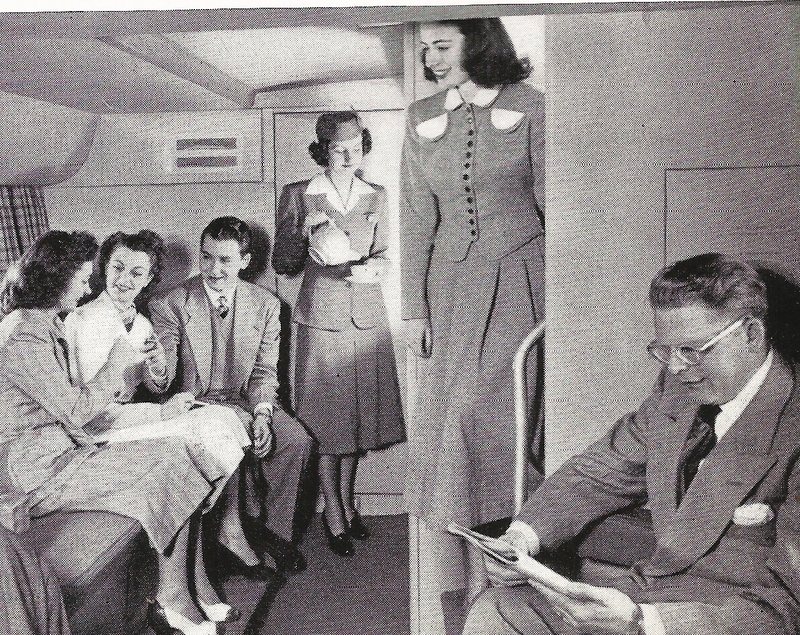 Pan Am also offered a guaranteed seat. 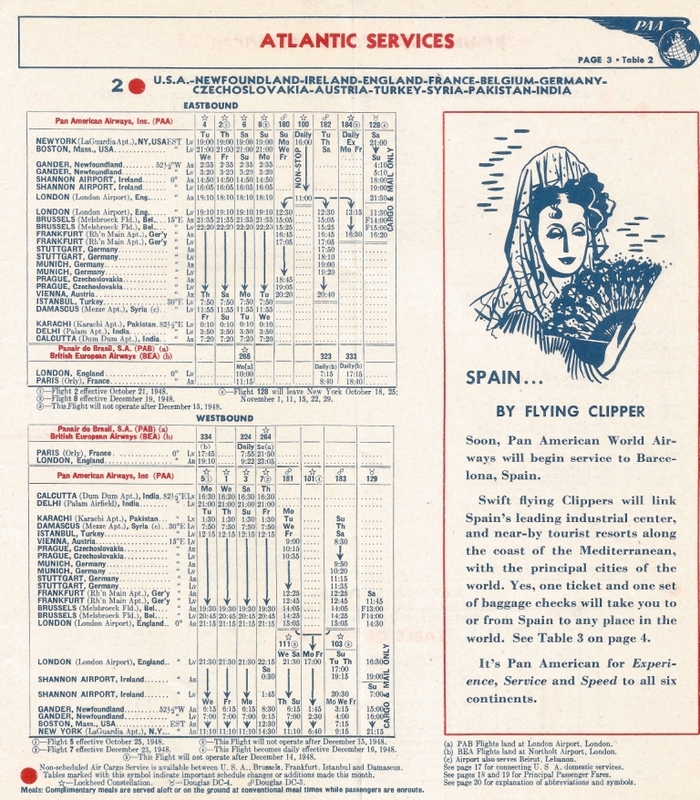 In one advertisement, called “No Shutouts”, it was proclaimed: “If a flight is full, out comes a second plane to pick up the slack. 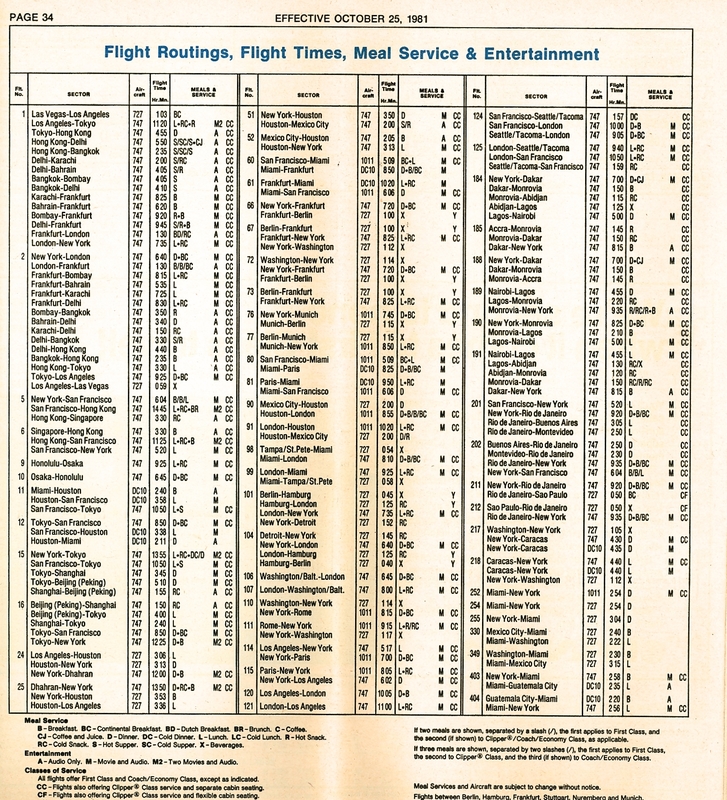 No bench warmers; everybody gets in the game.” In addition, as its first flight was at 6:30 a.m., beating Eastern’s first shuttle at 7 a.m., the Pan Am Shuttle called itself “The first choice”. 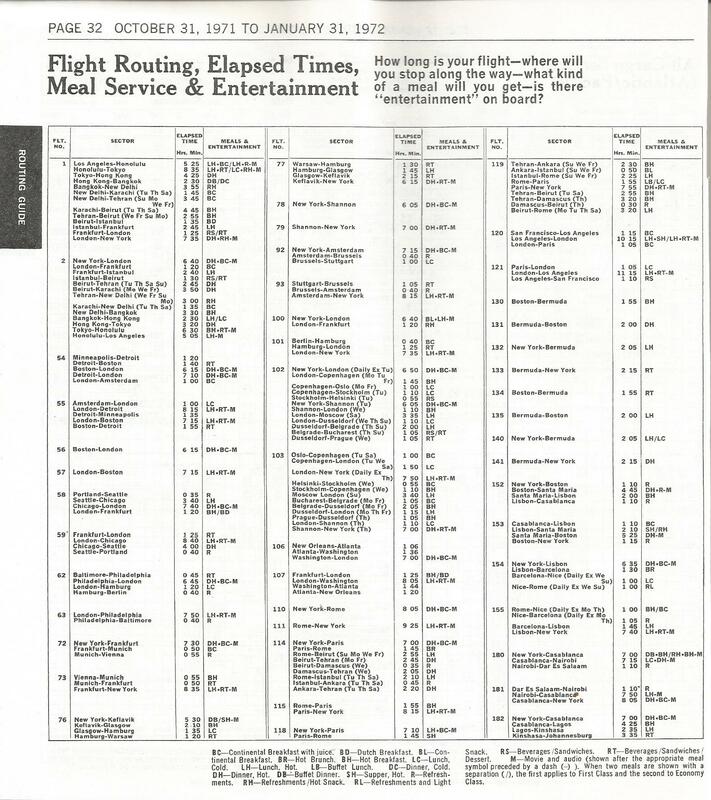 Also, to attract the high-yield business traffic, the shuttle was called “The Corporate Jet” and advertisements promoted in-seat telephones for use by passengers to “make connections in high places”. 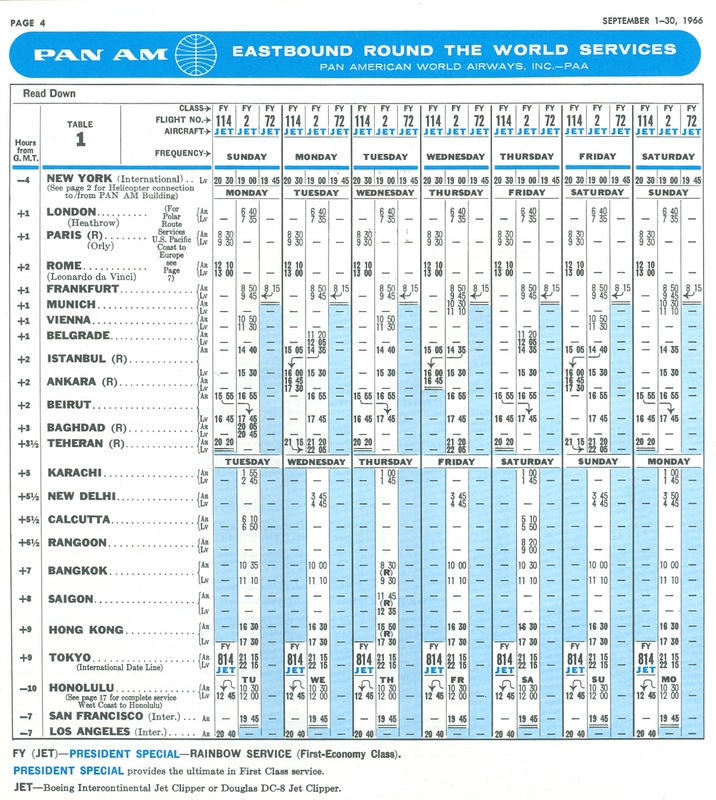 And in one of the best deals of all, members of Pan Am’s WorldPass frequent flyer program earned 2000 miles for every sector flown on the shuttle. 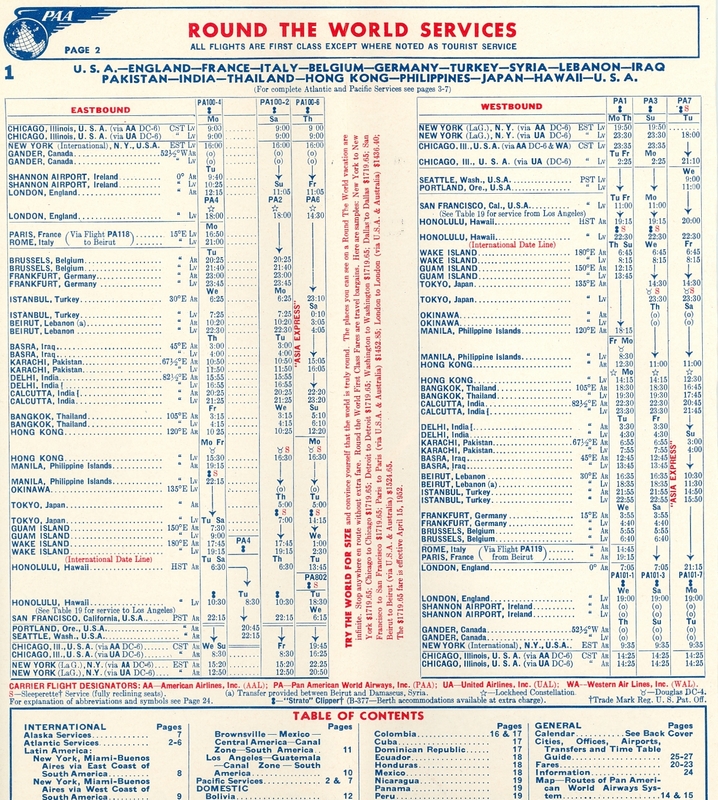 A passenger could accumulate a total of 8000 miles on a round trip between Washington and Boston! 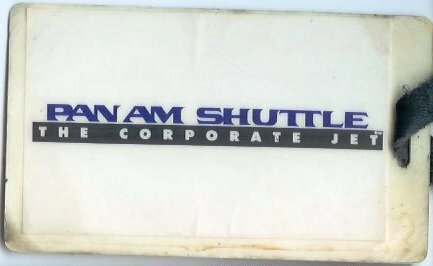 “The Pan Am Shuttle was launched in the Fall of 1986 from the Marine Air Terminal which had been built by Pan Am in 1940 for Trans-Atlantic flying boat operations. 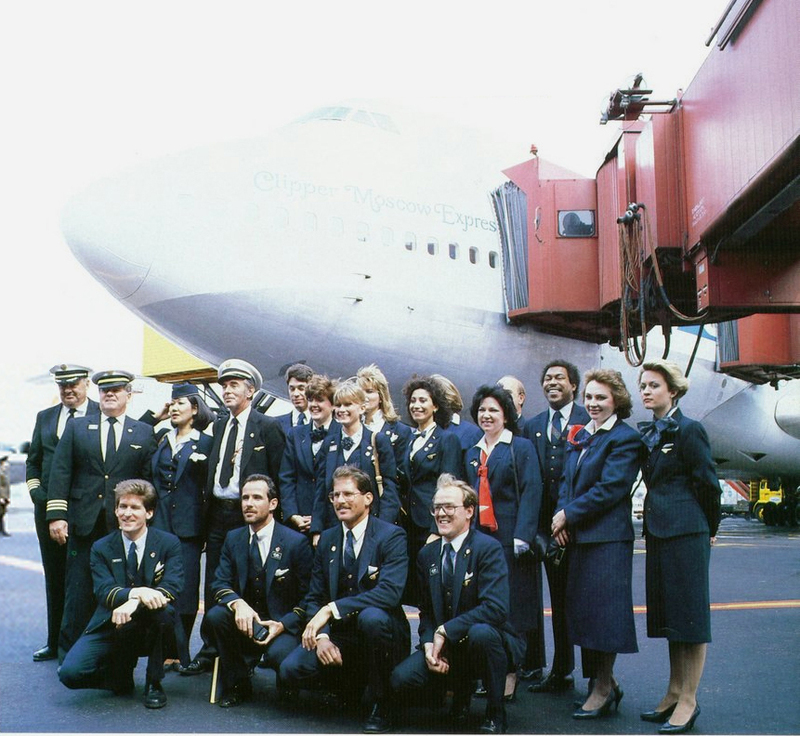 An extension was added on to the original terminal allowing it to accommodate up to 5 jets and hourly service (on the half hour) to Boston and Washington, DC was offered from 6:30am to 8:30pm (Washington), 9:30pm (Boston). 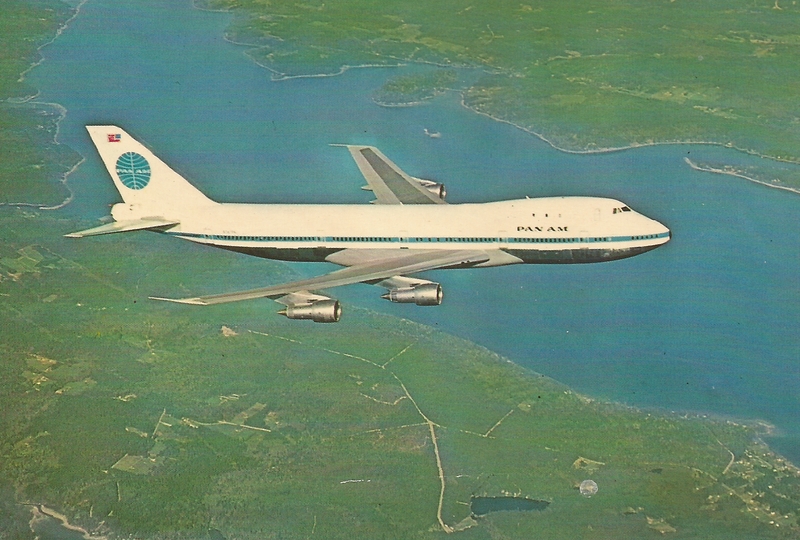 The Pan Am Shuttle was a wonderful operation that was very popular and profitable for Pan Am. 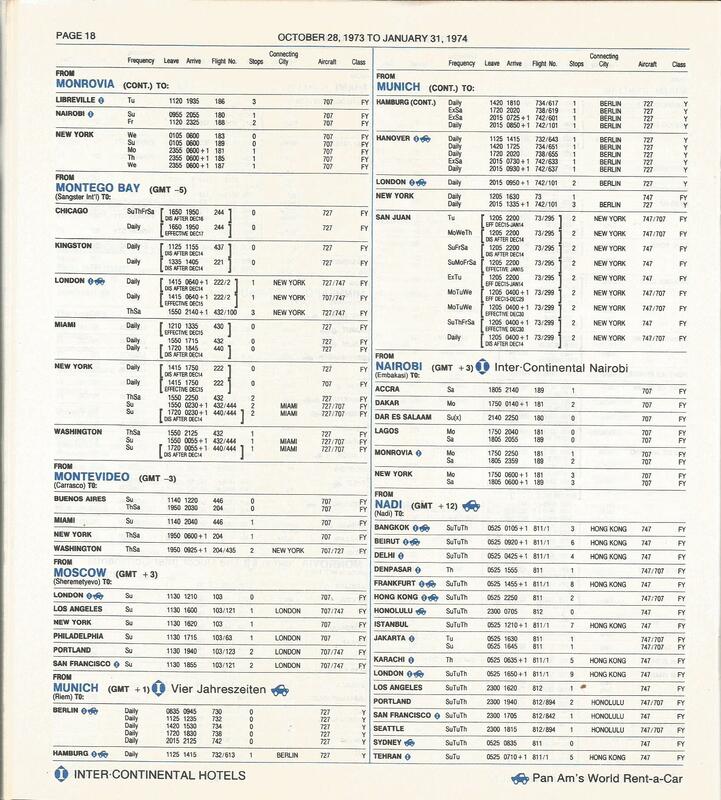 Unfortunately, with the sale of Pan Am’s remaining European routes and Frankfurt hub to Delta, the Shuttle was part of the deal, and Delta took over operations on 1 September 1991. 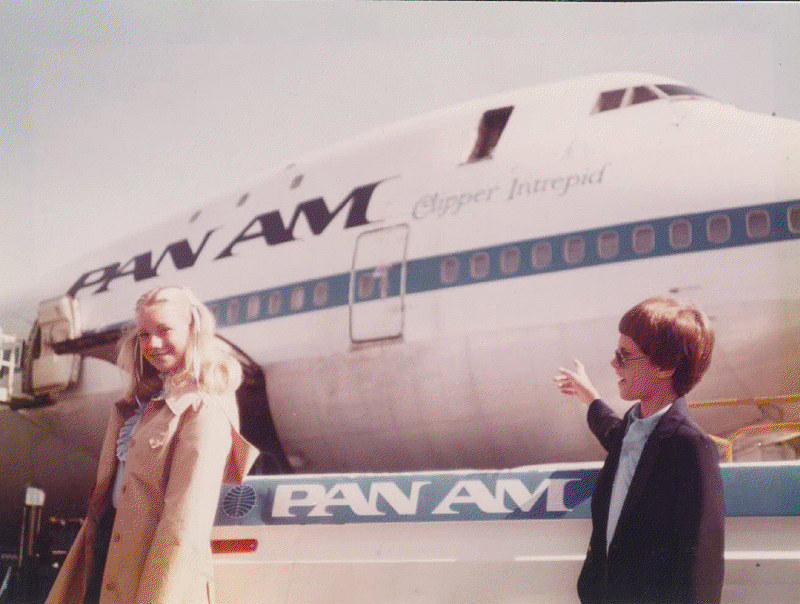 Kelly Cusack’s story about the Pan Am Shuttle contains memories of his experiences with the operation as well as insight on its inception and some of the innovative marketing used to make it so successful. 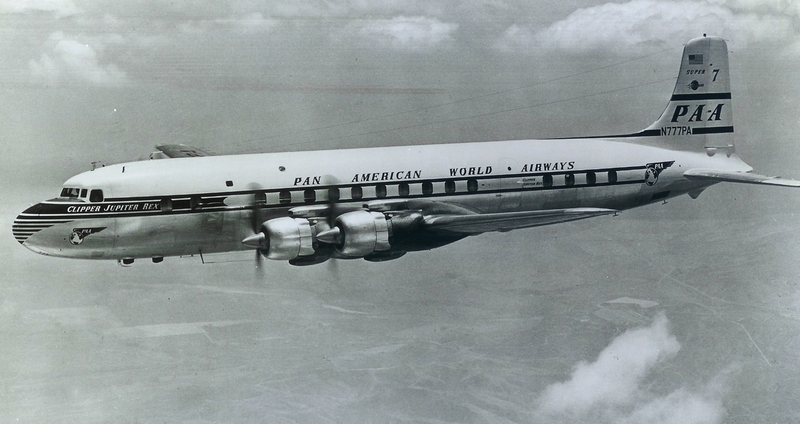 His is one of 71 stories by former Pan Amers in Pan American World Airways – Aviation History Through the Words of Its People.